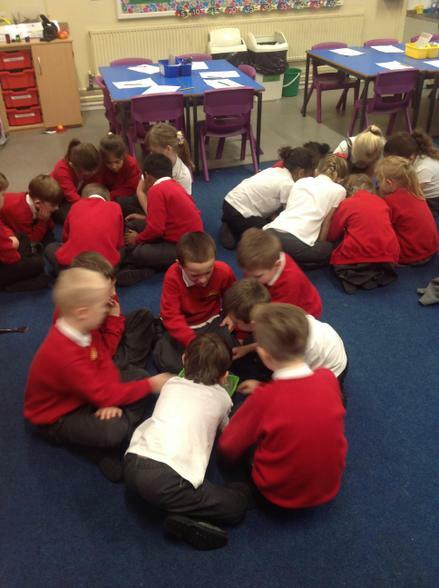 This half term we are learning to use Scratch Junior to create sequences of code. 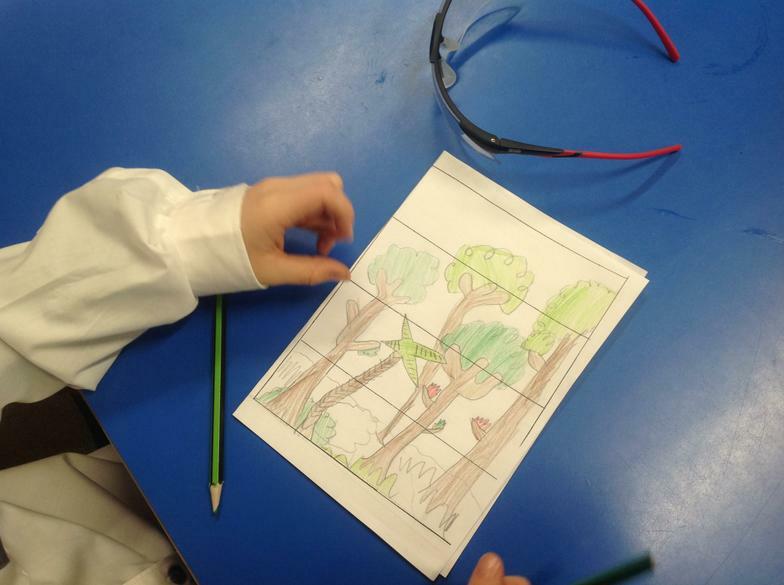 This week we opened the app, started a project, chose characters and backgrounds and edited colours. Next week we need to practise deleting backgrounds and characters and we will begin to record sounds and make speech bubbles for our characters. 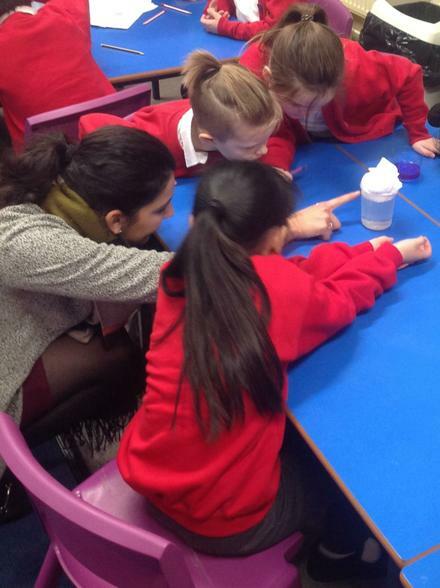 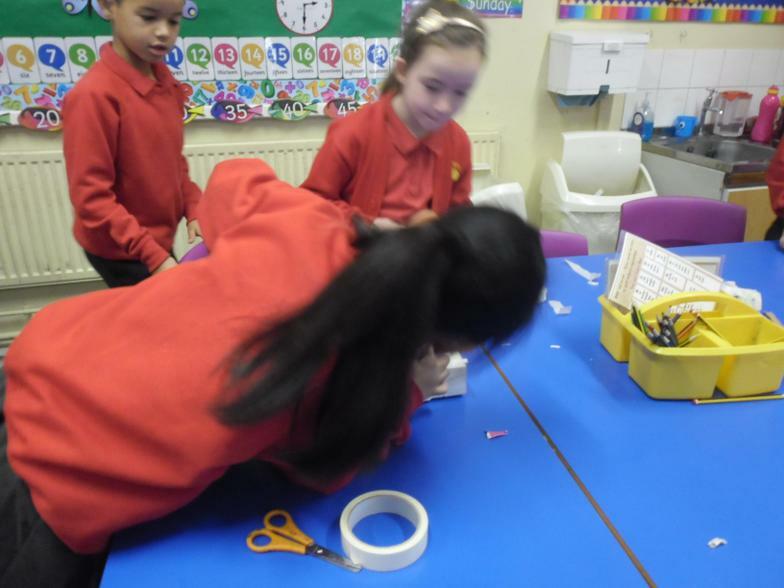 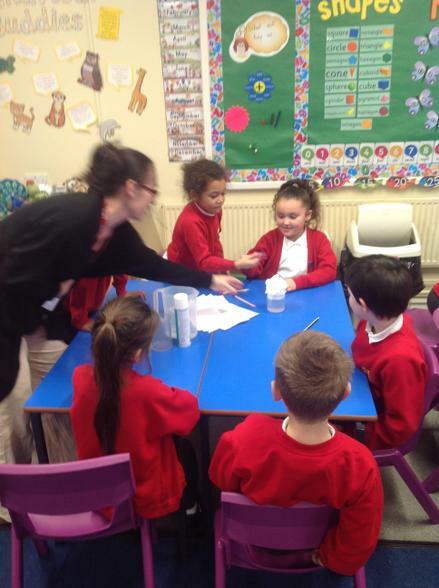 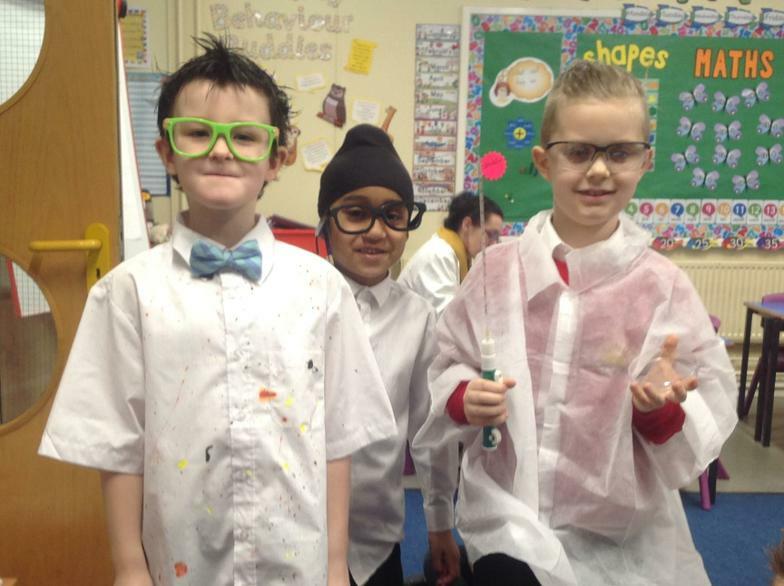 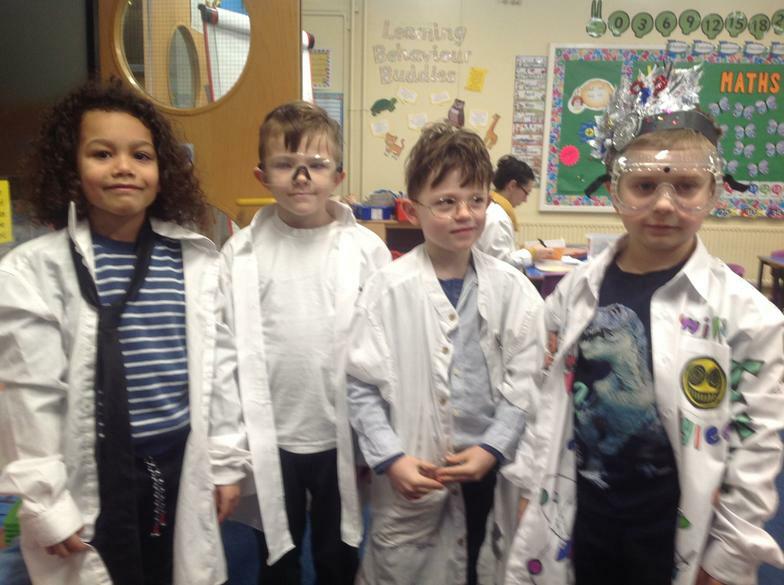 This week has been Science Week, we abandoned our usual afternoon activities and carouseled around the year group performing science investigations based on journeys and water. 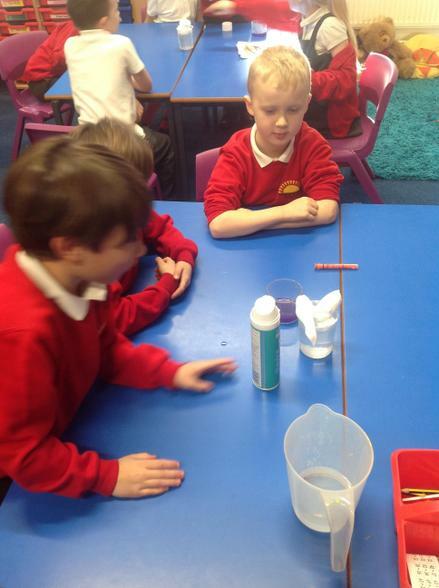 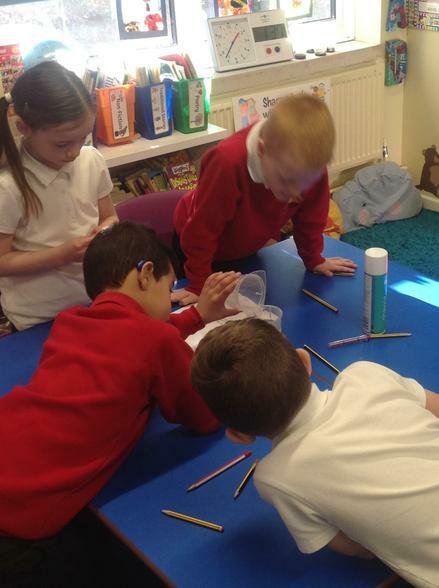 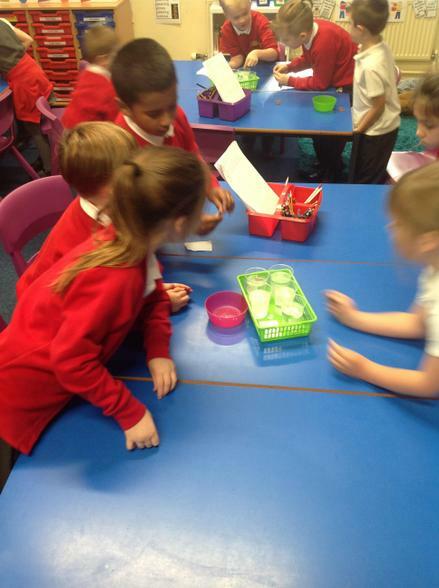 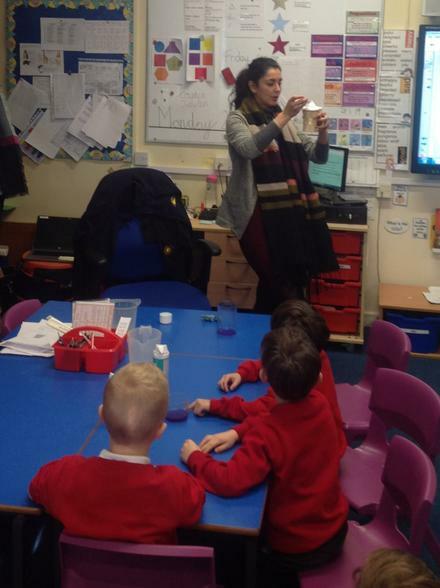 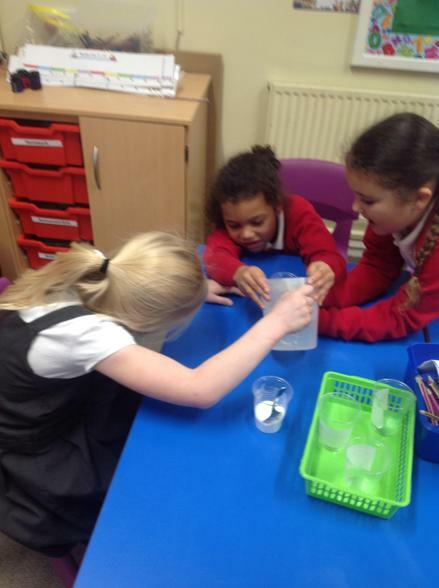 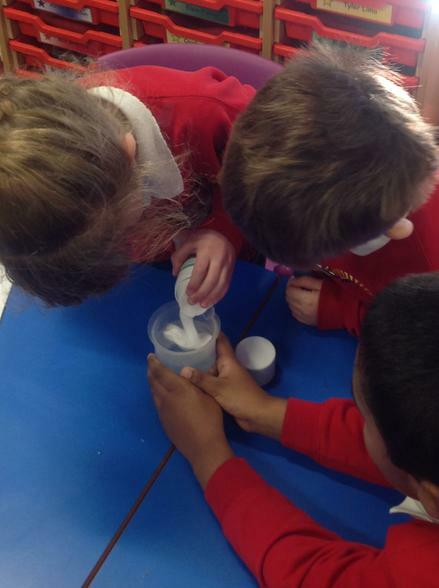 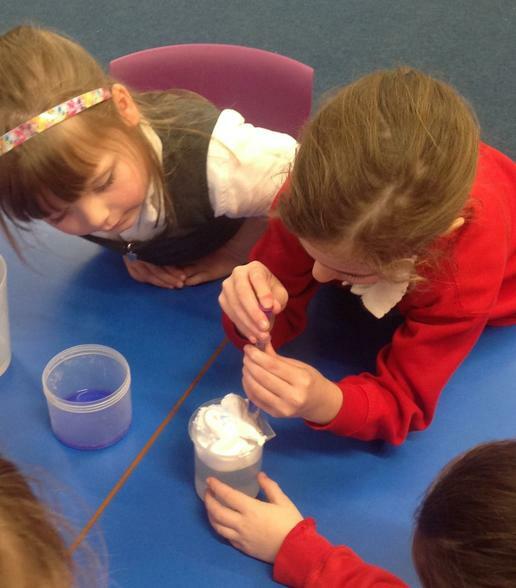 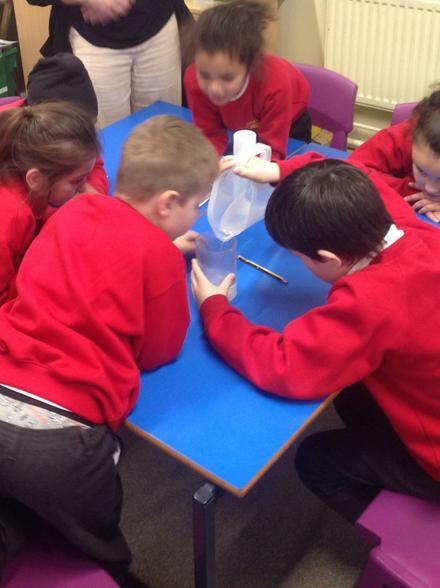 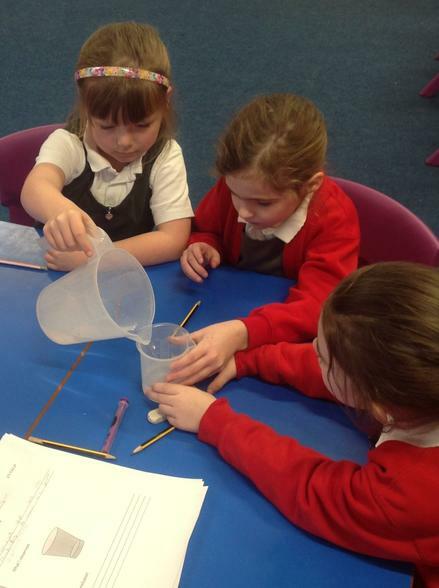 In 2BP we watched as food colouring collected in shaving foam and then fell into the water below like rain. 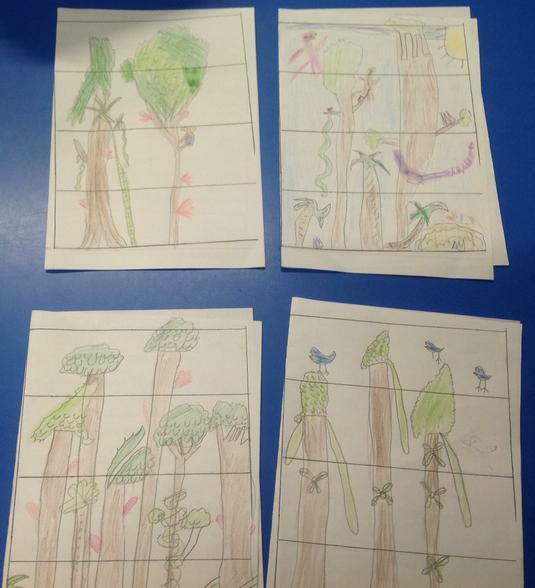 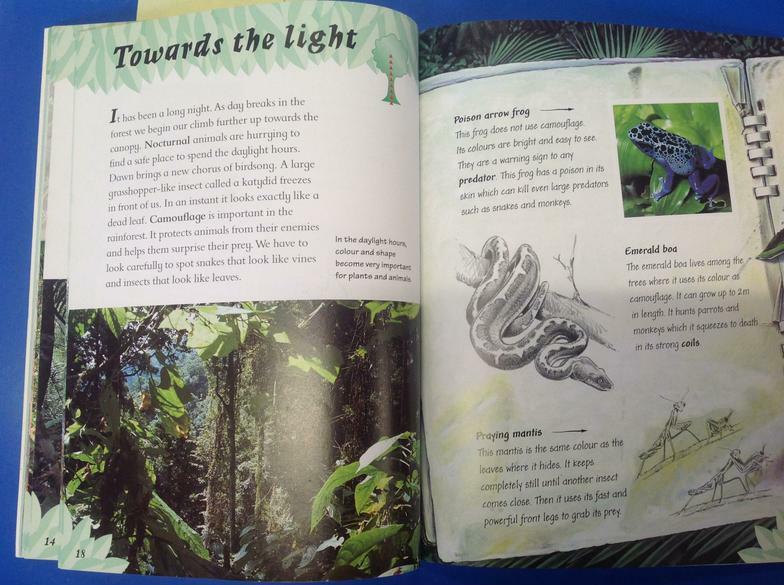 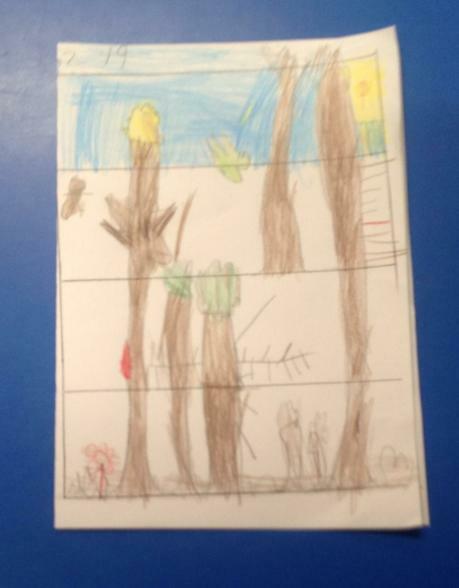 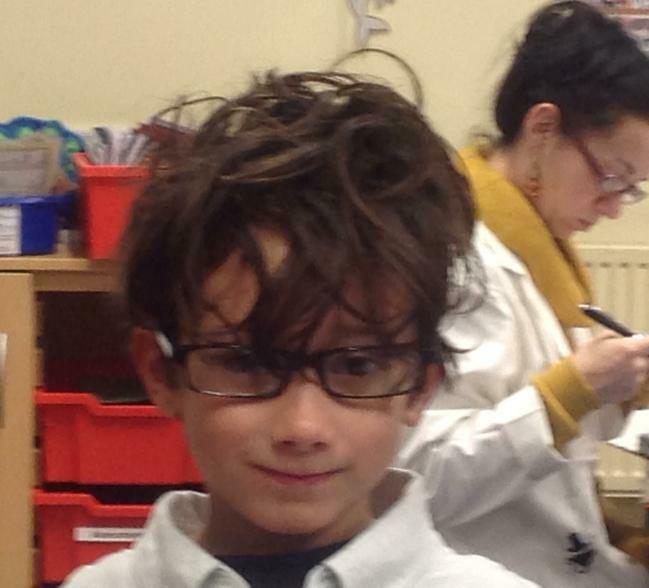 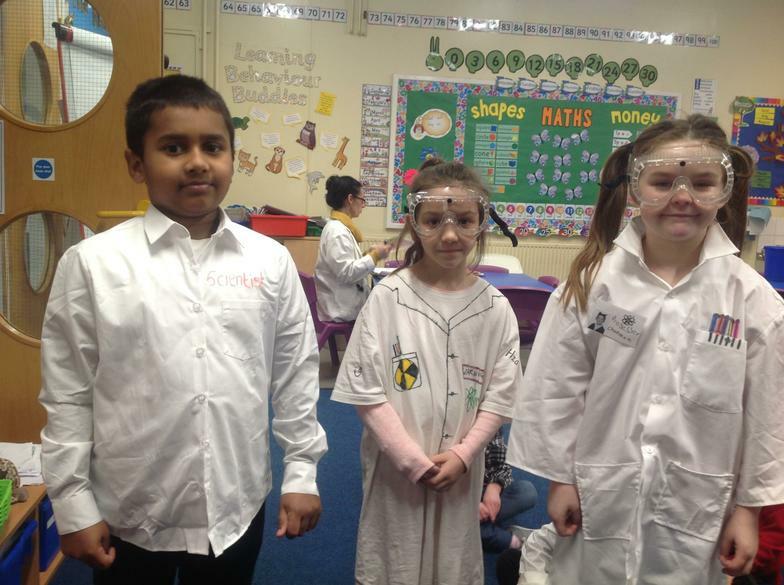 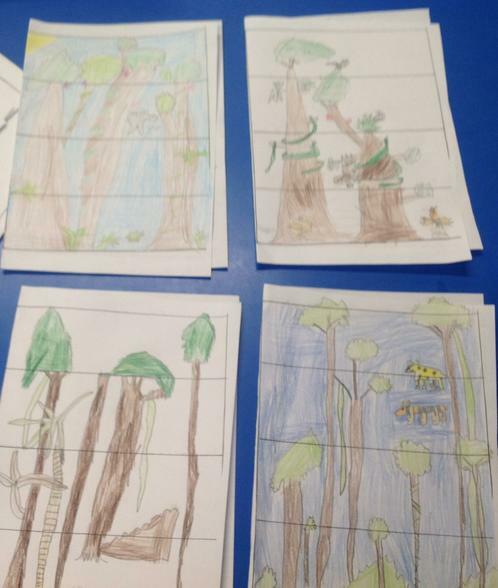 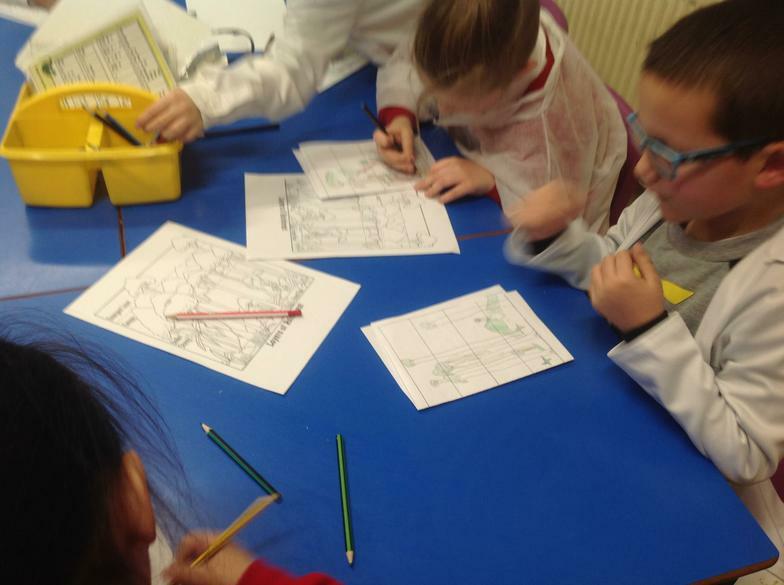 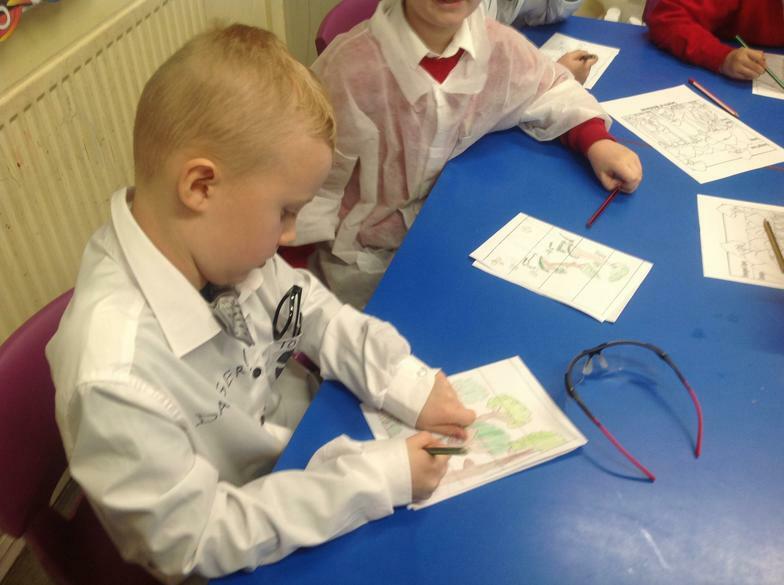 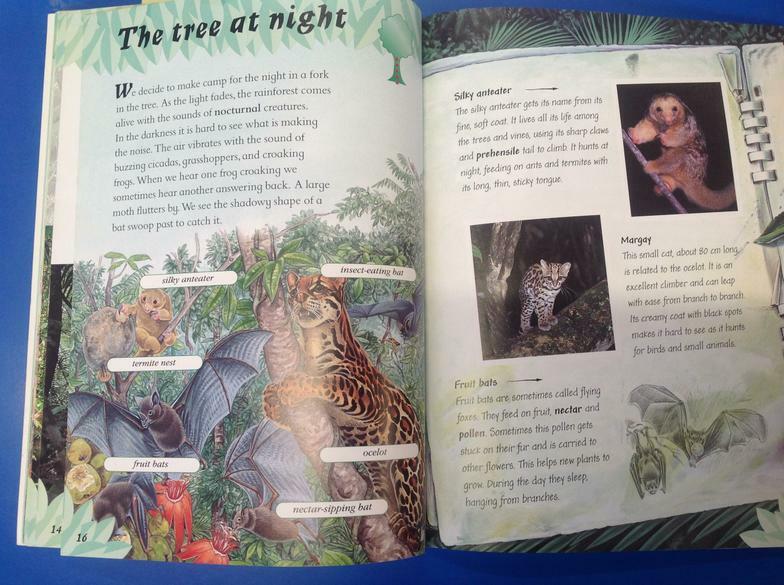 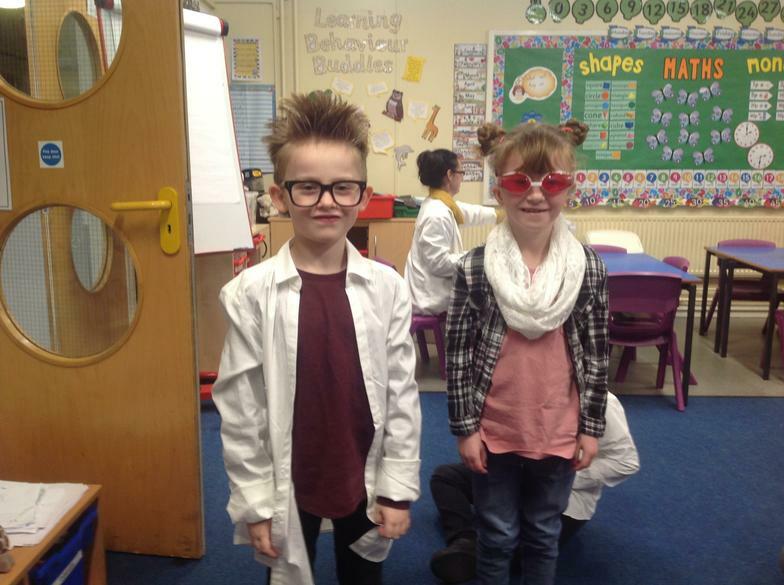 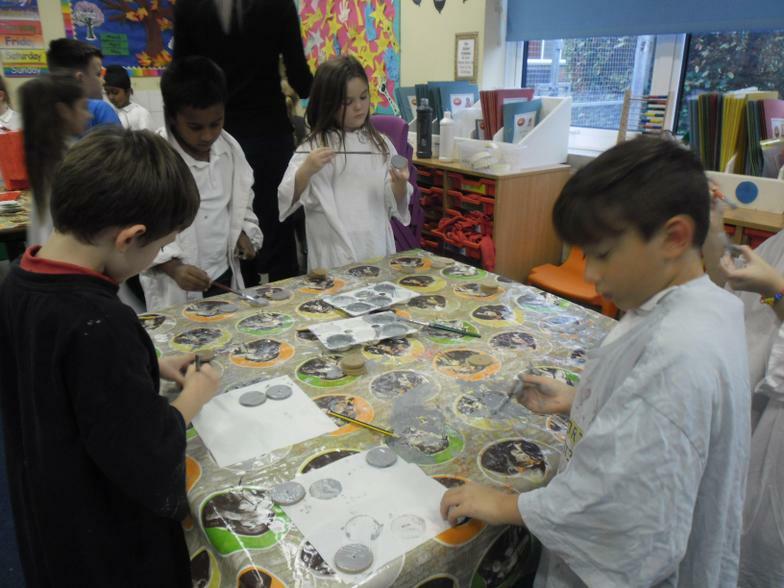 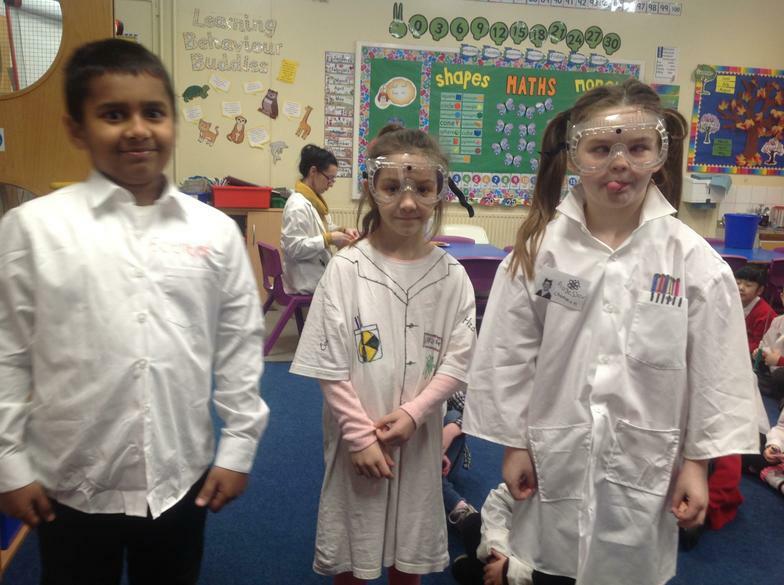 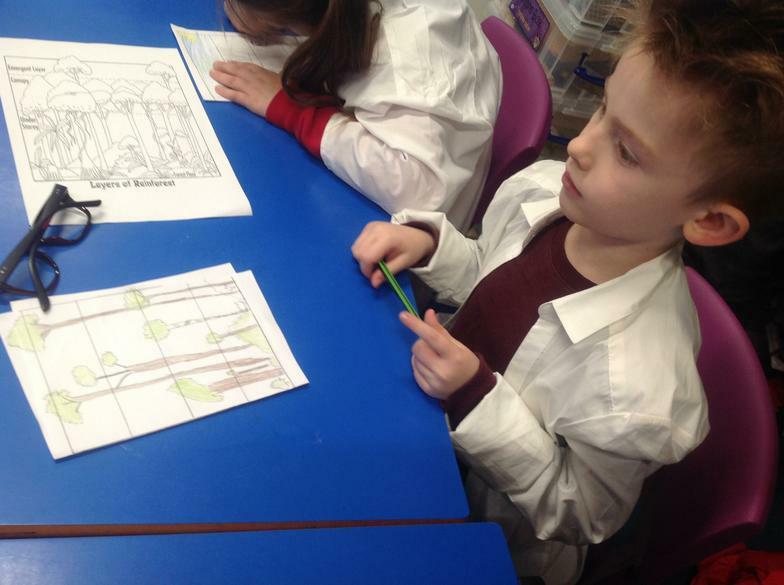 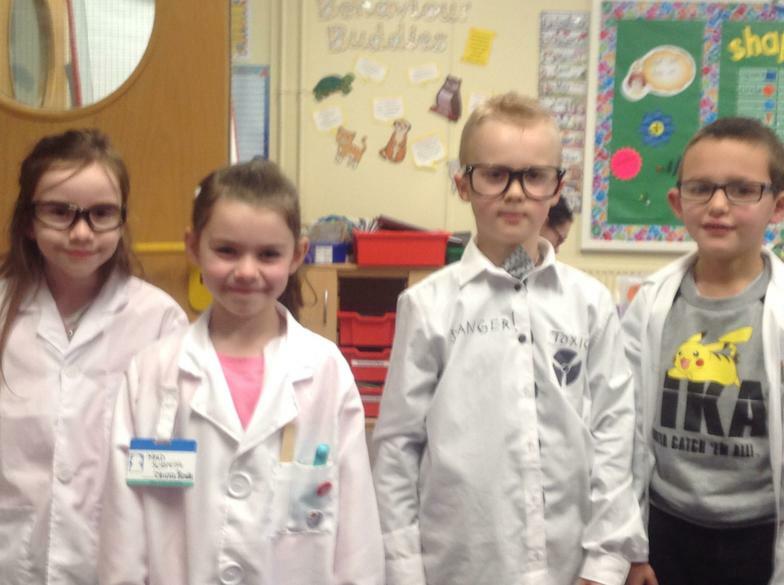 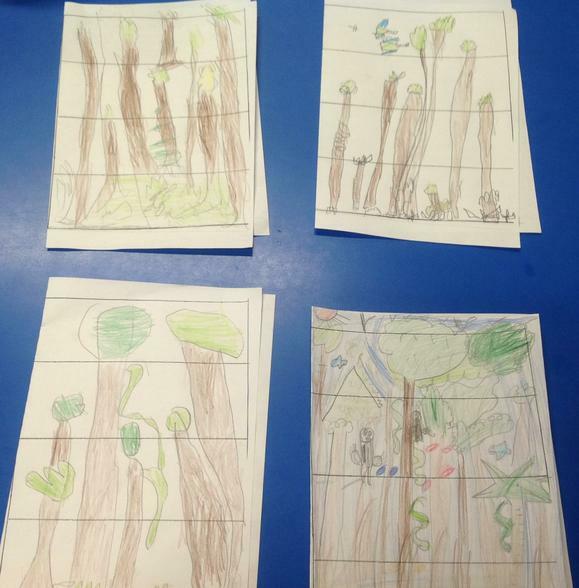 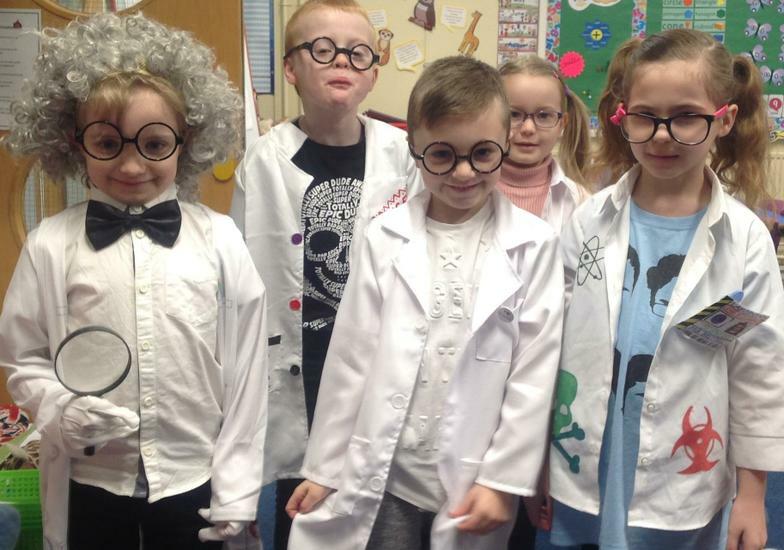 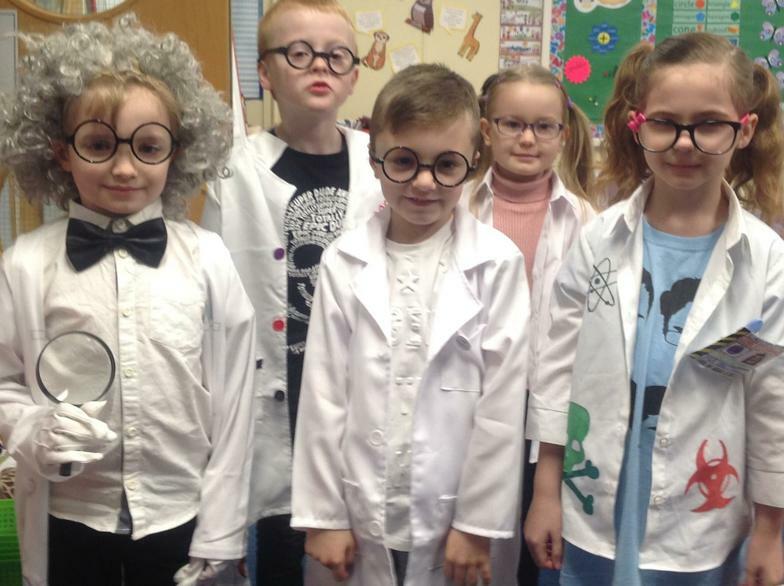 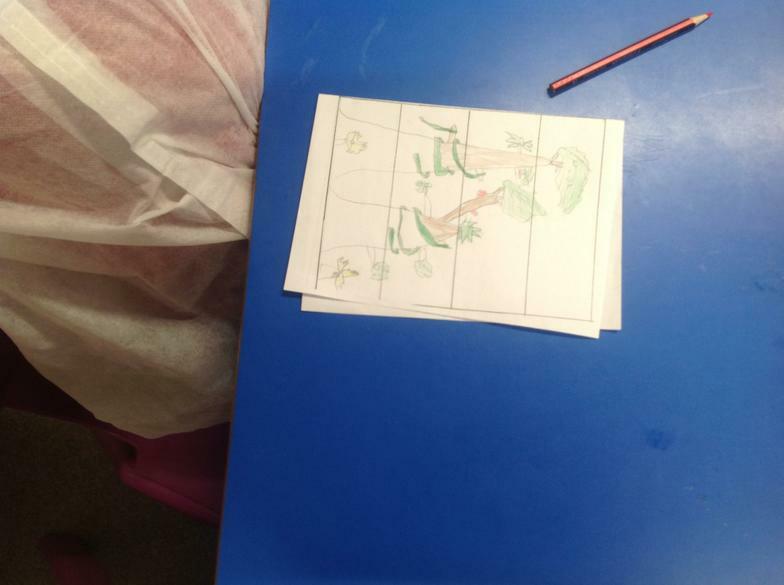 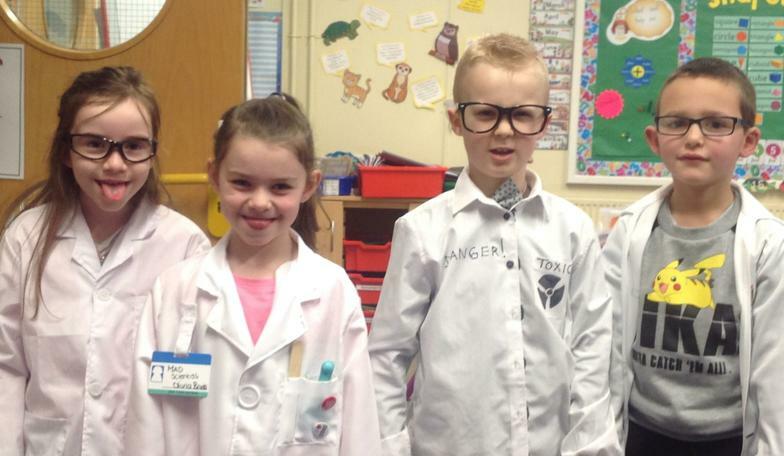 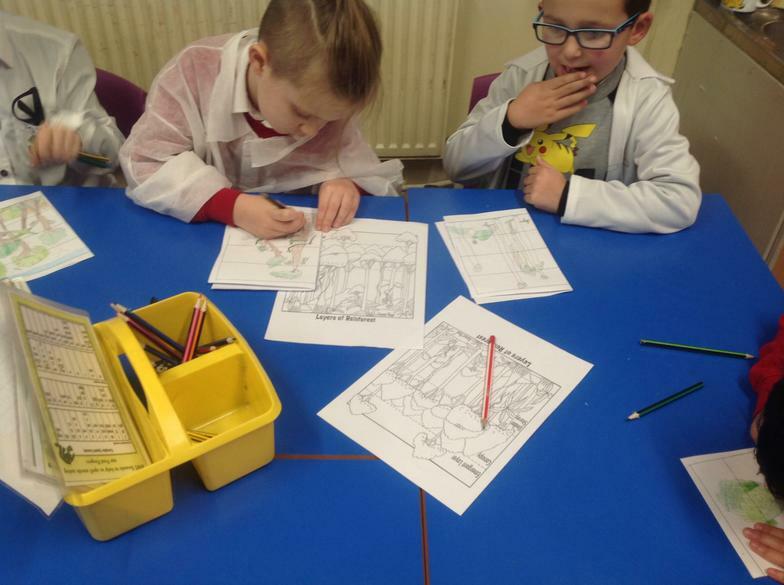 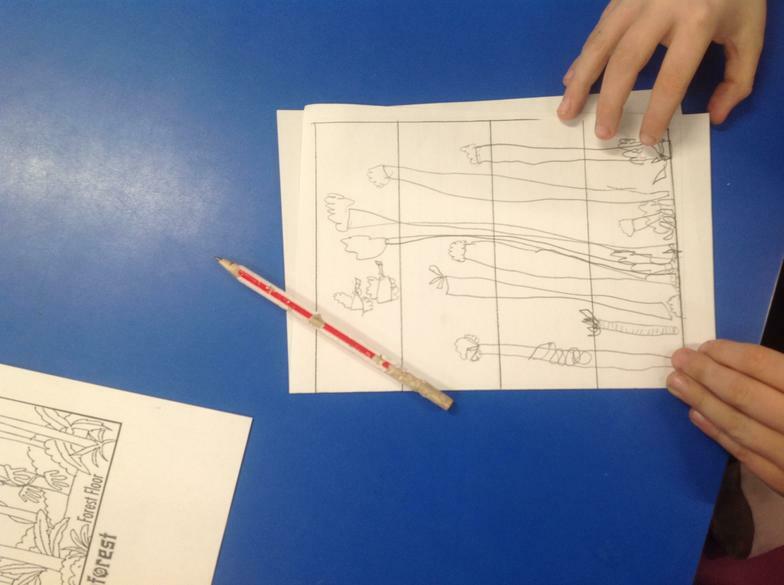 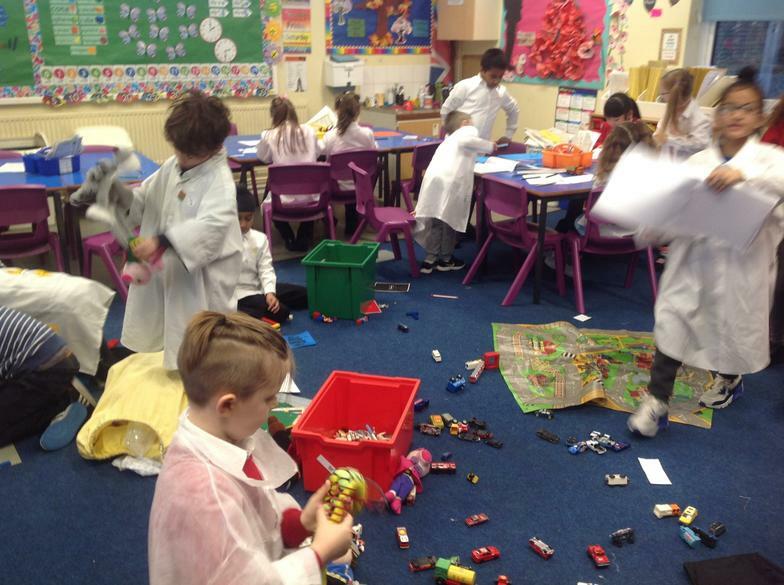 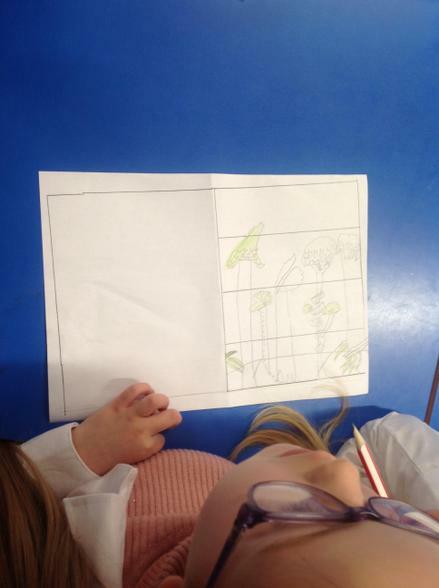 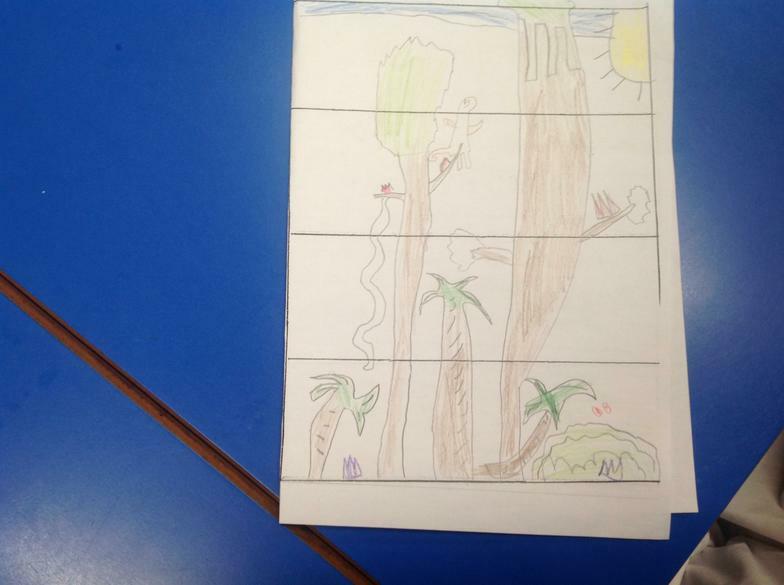 We came to school dressed as mad scientists; wrote an information text and drew the layers of the rainforest. 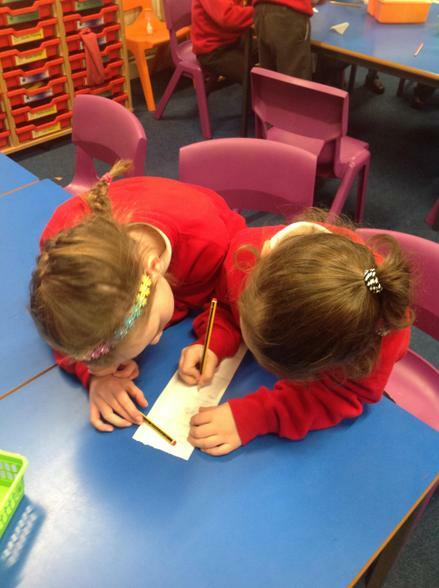 Mrs Wordsmith this half term are all words based on actions. 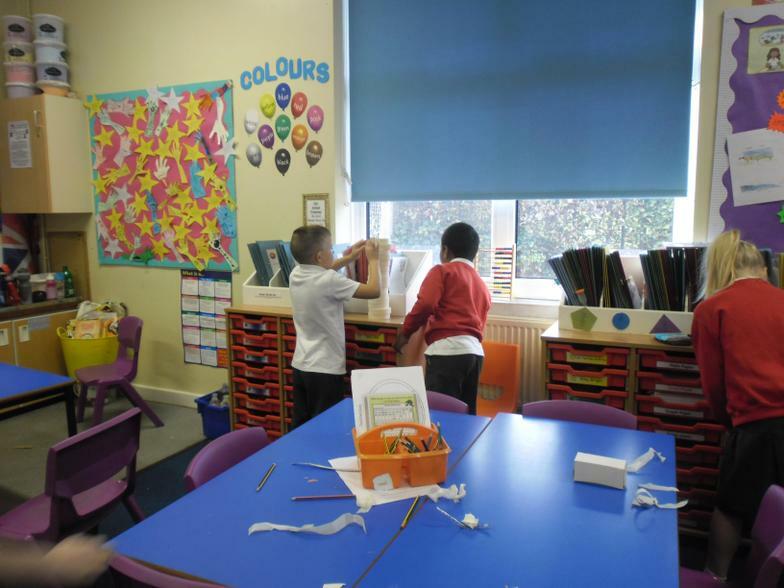 Welcome back to another new year, our topic this term is called 'Rain, Rain Go Away'. 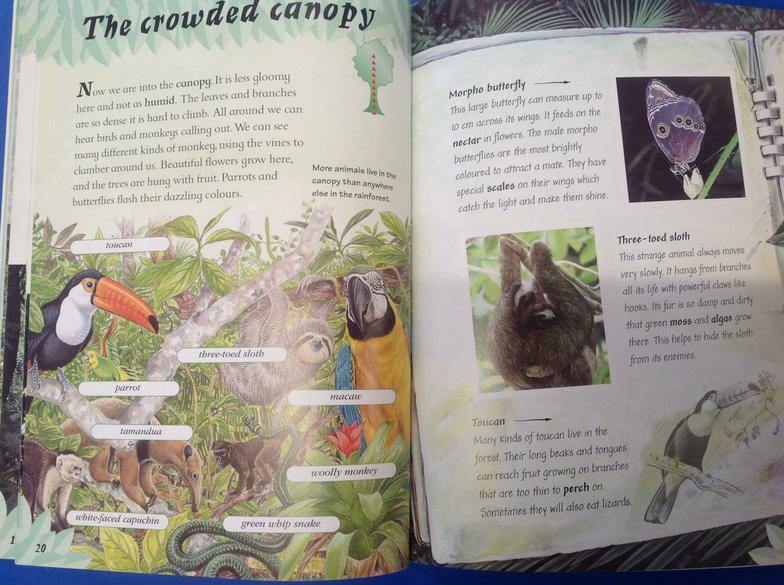 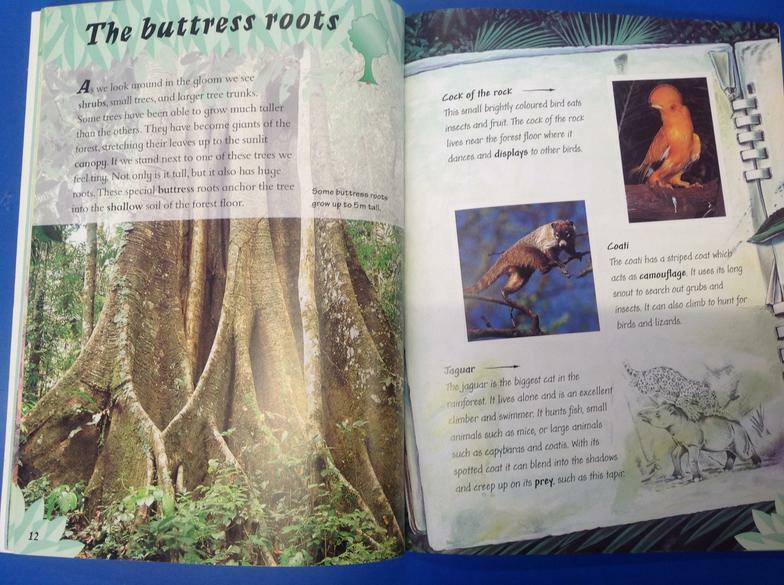 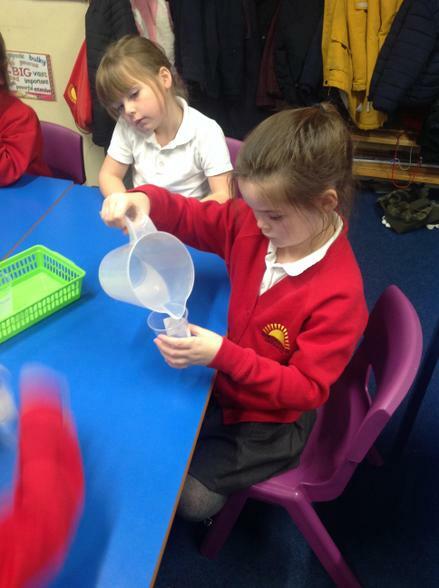 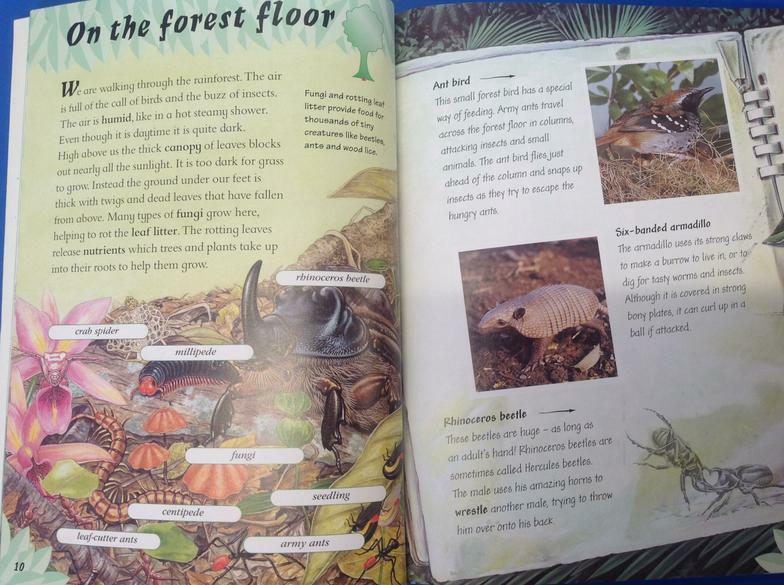 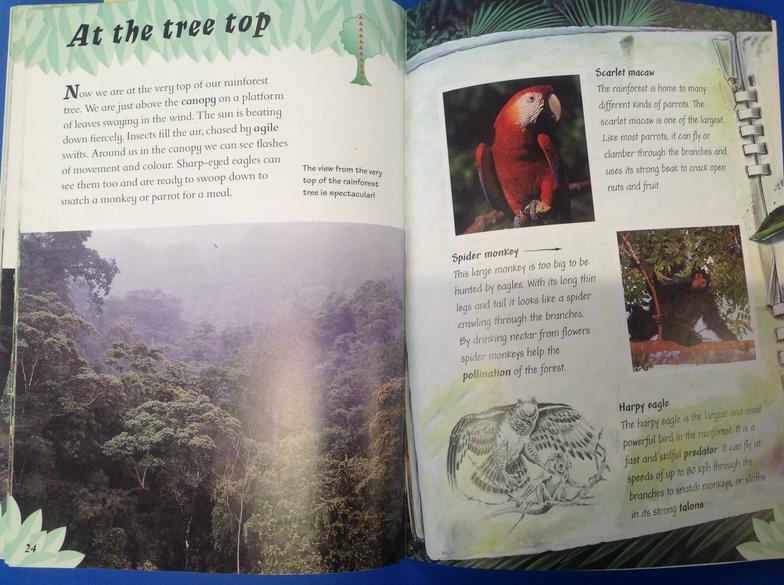 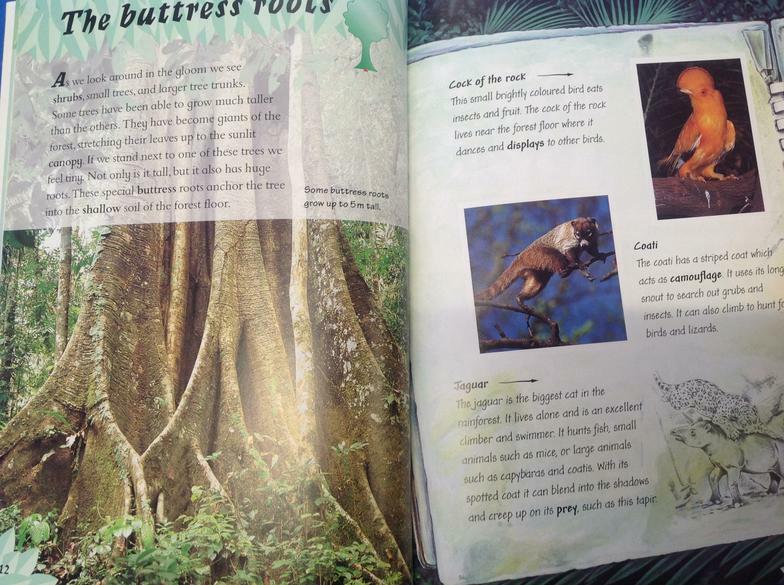 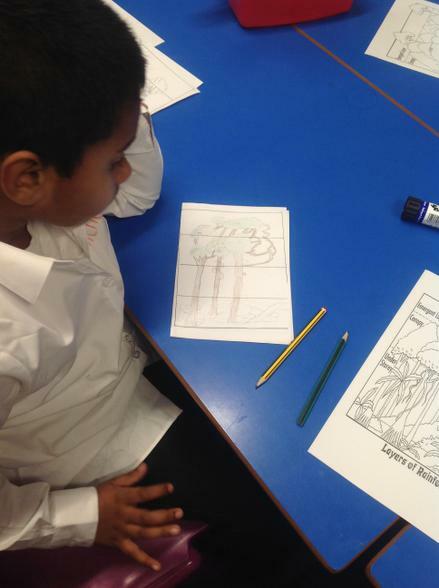 We will learning about the water cycle and finding out where the rainforests are around the globe; what the weather is like and what animals live there. 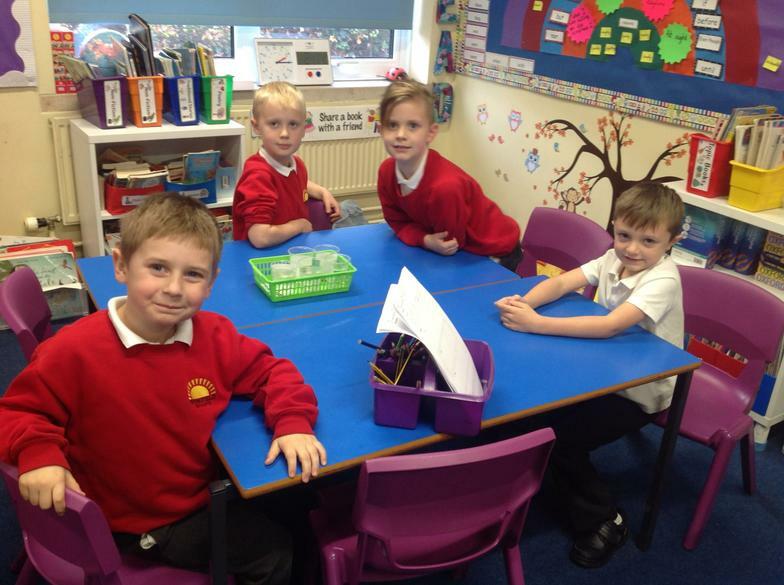 This week we will be starting to use a new vocabulary scheme called Mrs. Wordsmith. 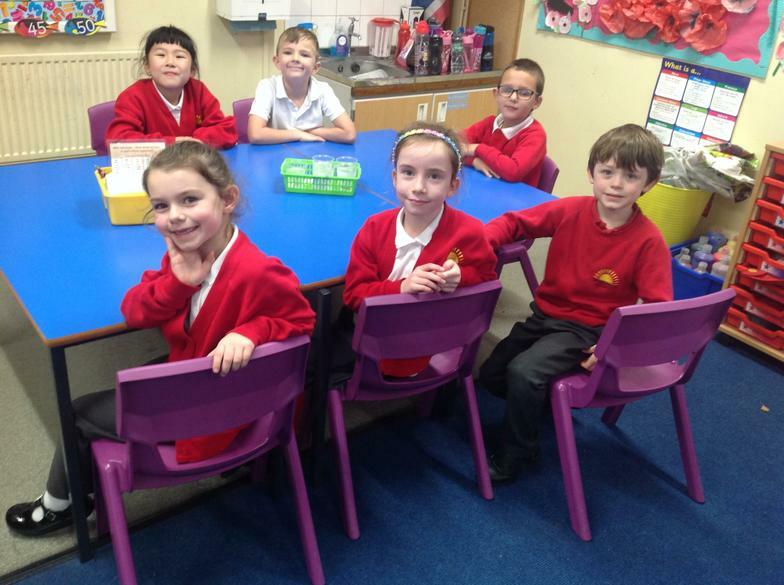 The words we will be learning each week will be added to the class page weekly. 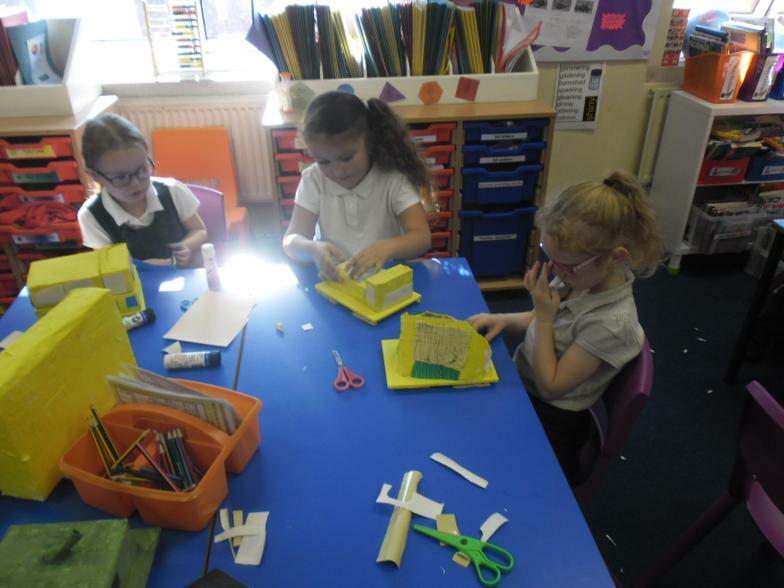 The words will also be displayed around the playground so that the children can use them, we ask that you use them in conversation with your child throughout the week. 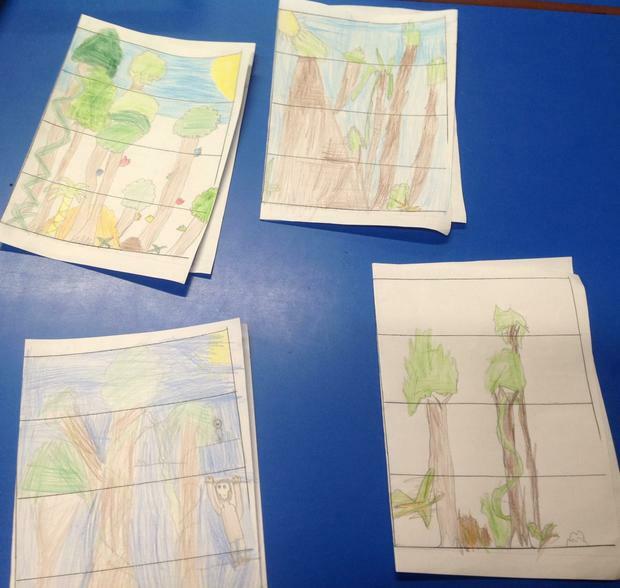 We had some terrific examples of homework to explain the water cycle. 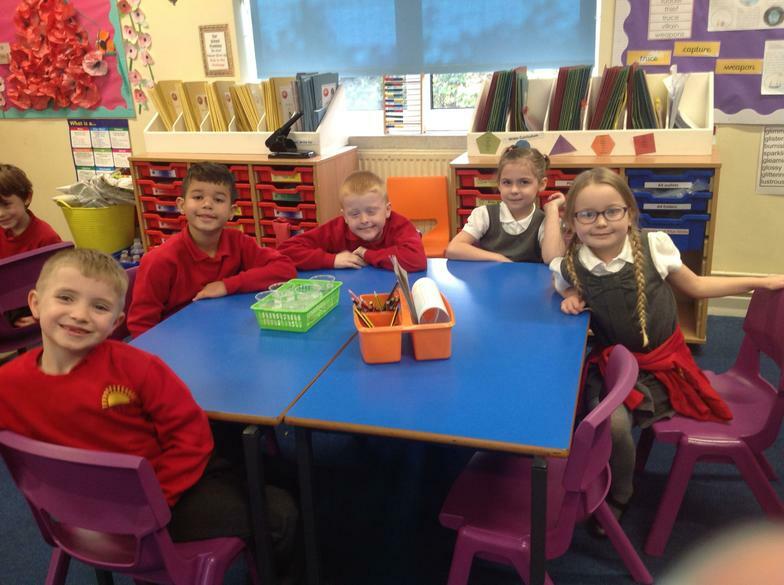 Welcome to 2BP so far this year we have already settled into our new routines and have revisited our learning buddies to help us develop and improve our resilience and perseverence as learners. 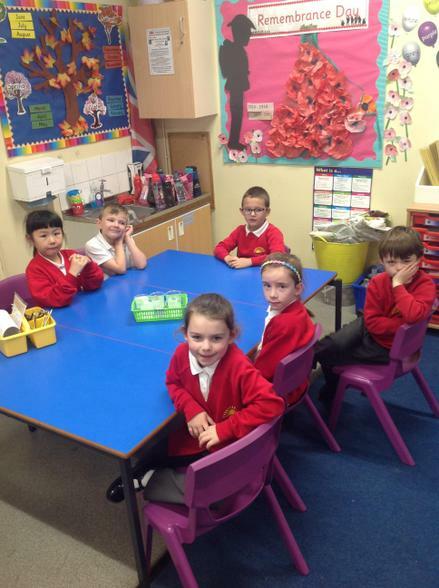 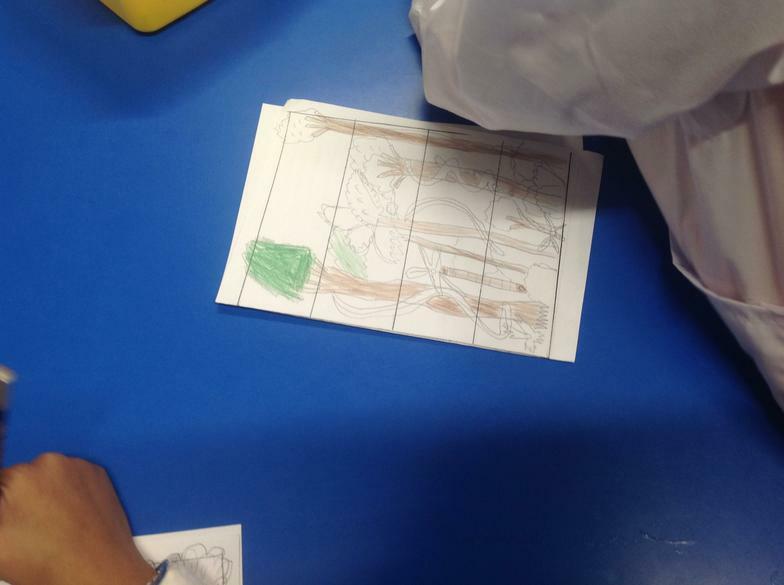 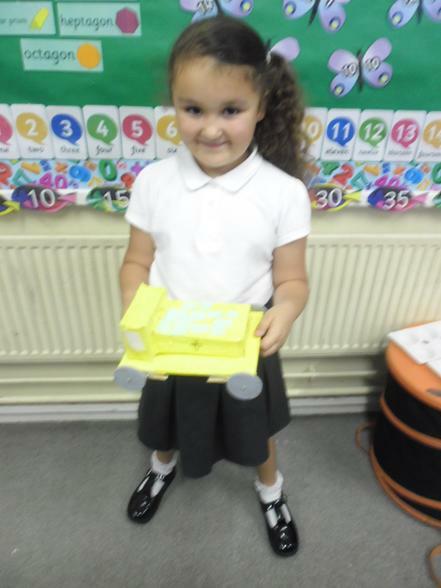 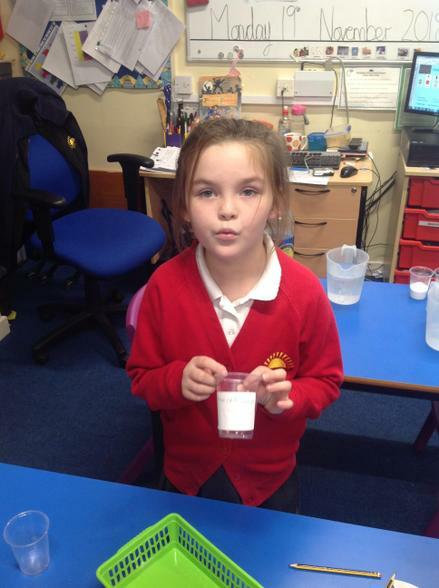 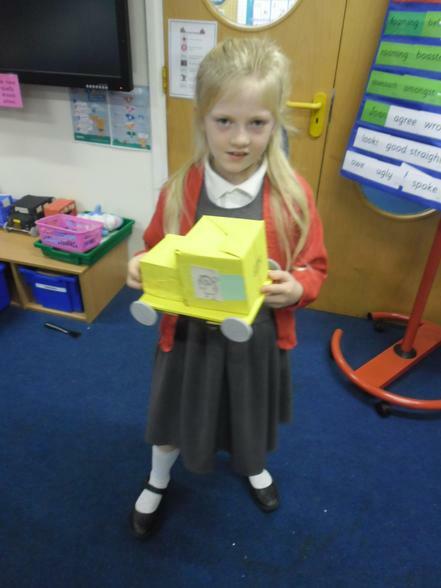 Our Eco school representative is continuing from Year 1 and we have voted for our new class school councillors. 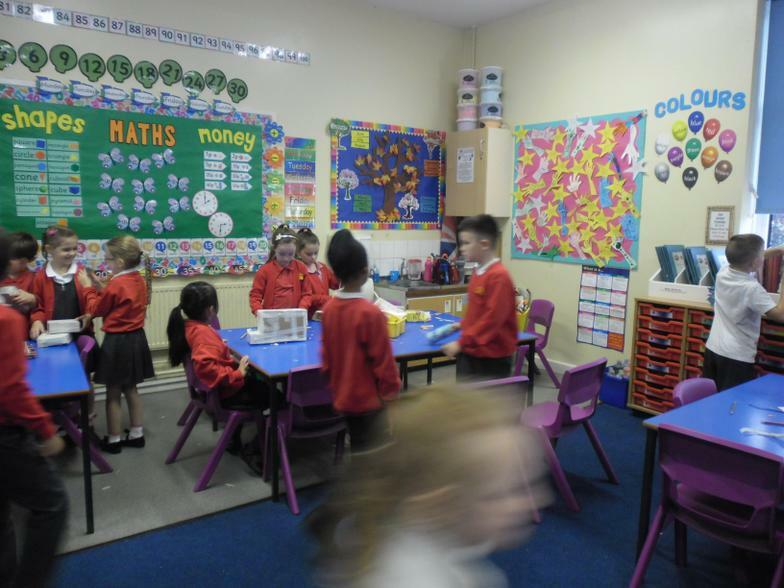 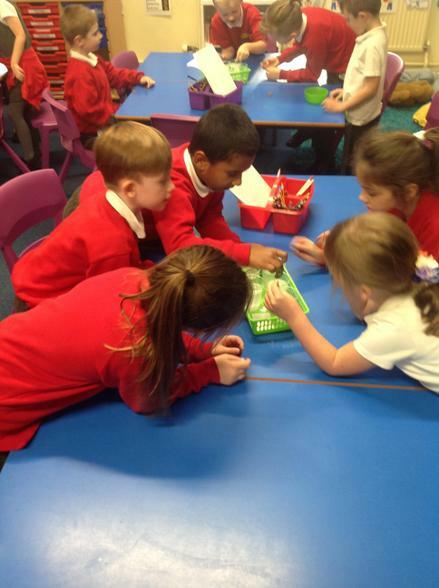 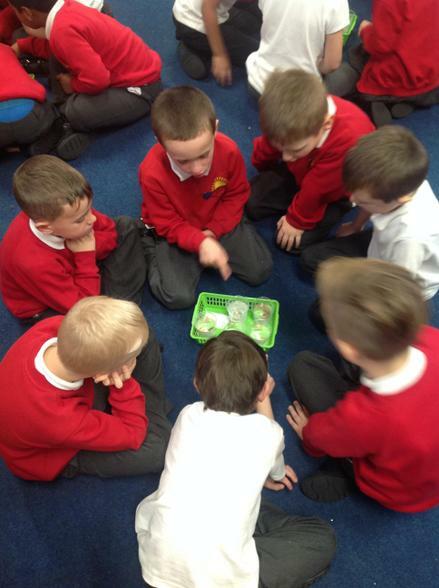 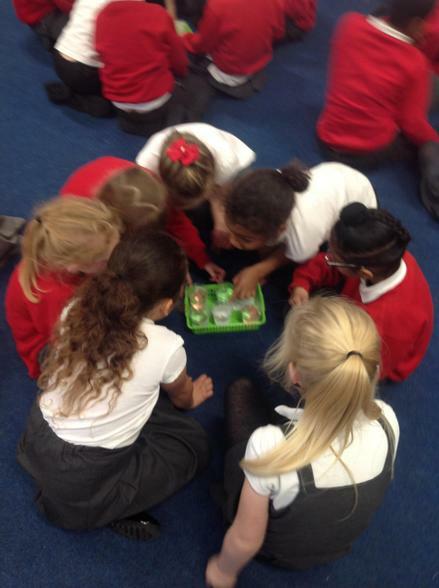 We have once again began our partner work and we have been pracitising place value and 10's and 1's this week. 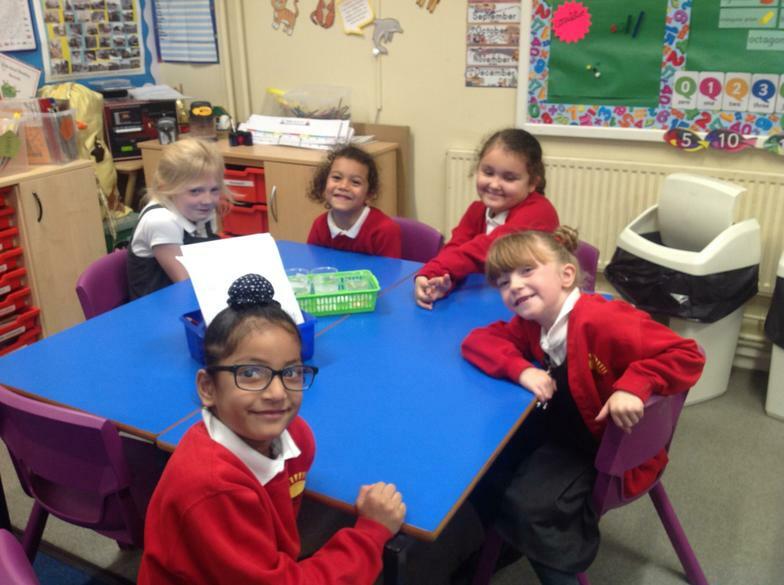 We now have access to an exciting new spelling programme called Spellingframe; your child's individual login is in their diary and they can now learn their weekly spellings by practising online at home. 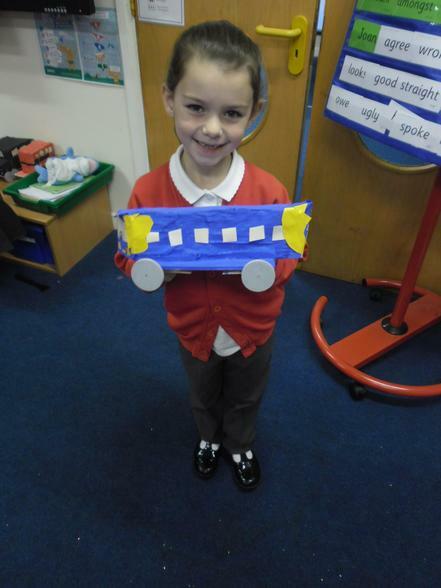 On Thursday 27th September we visited the Ipswich Transport Museum in Cobhan Road. 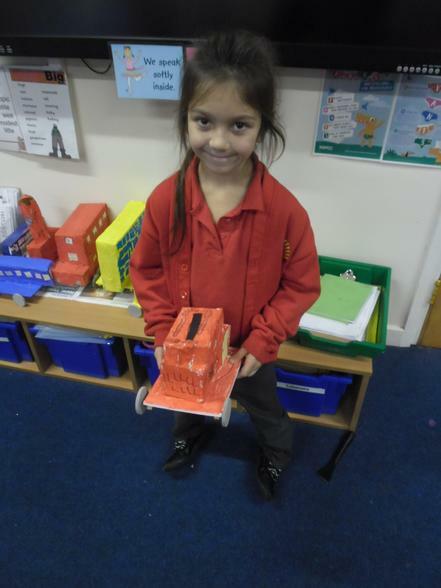 We had a great time, we travelled over the Orwell Bridge and had an amazing view of sailing boats on the River Orwell. 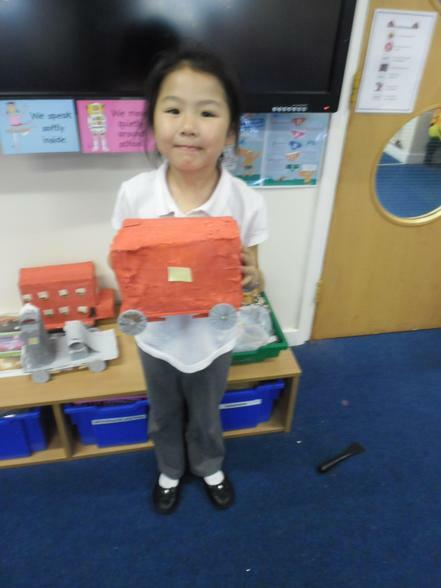 We were able to climb and explore buses, trams and fire engines that had all at one time been used to carry passengers around Ipswich. 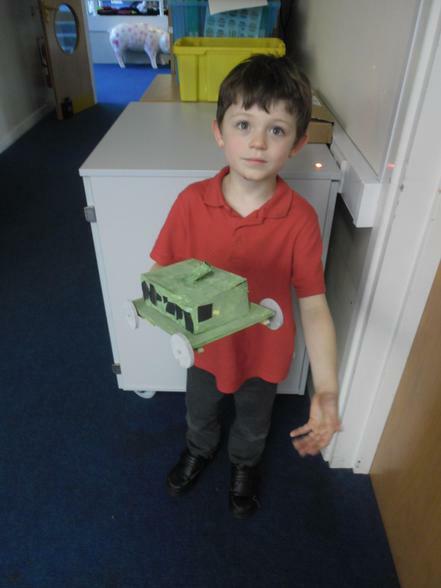 At the end of the visit the ITM kindly gave all the children a free admission ticket so they can visit again before the end of the year. 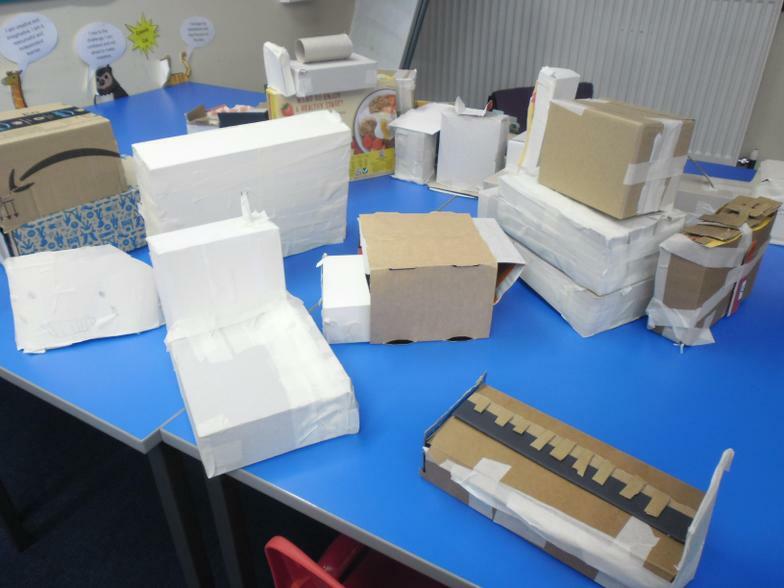 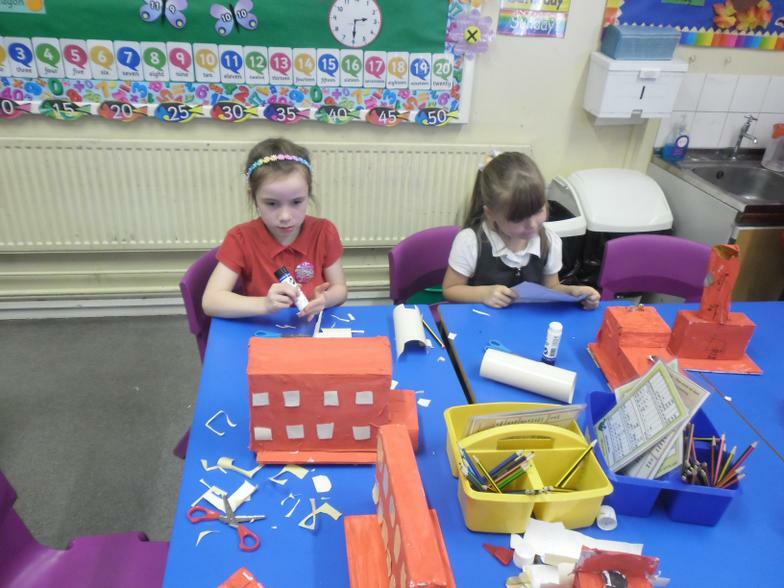 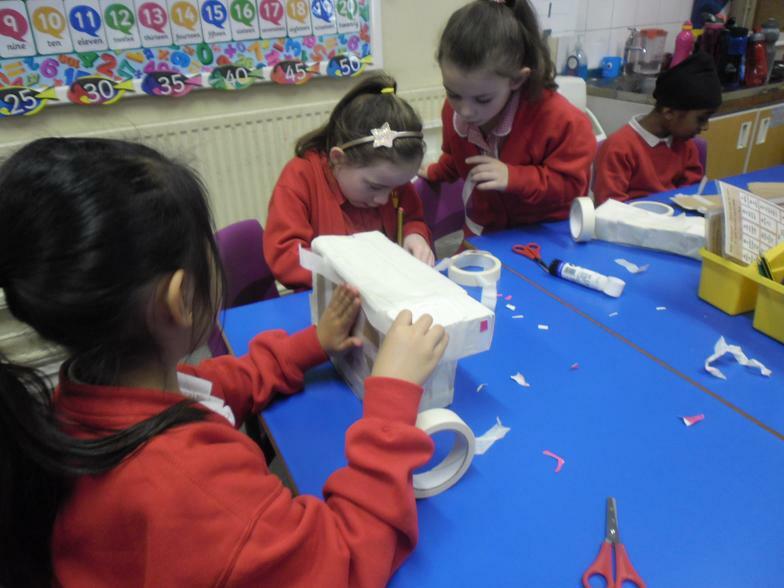 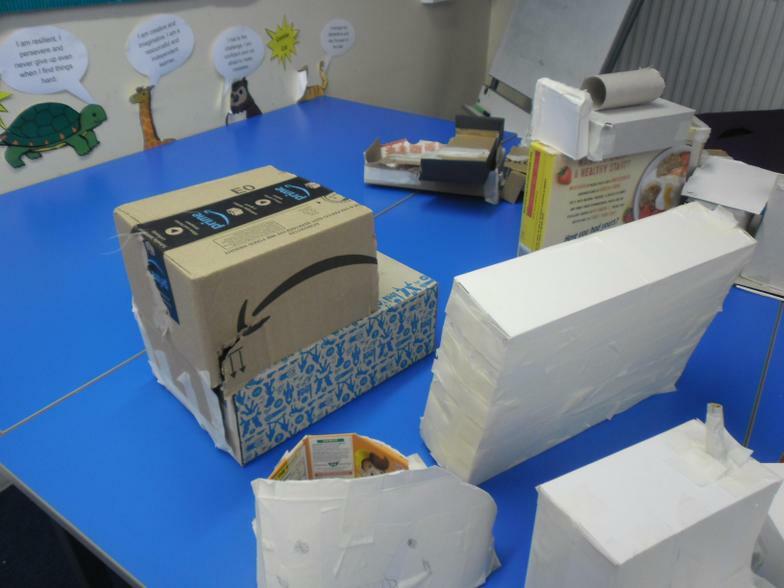 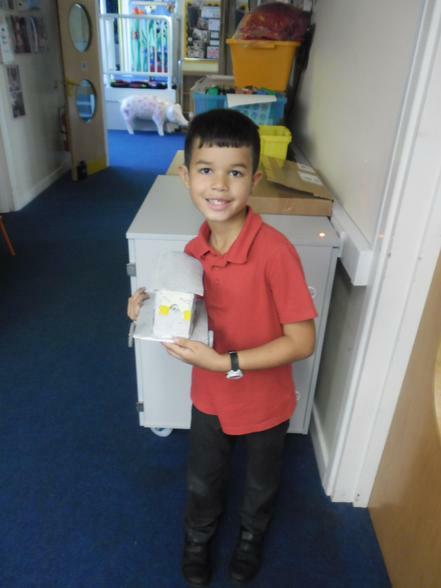 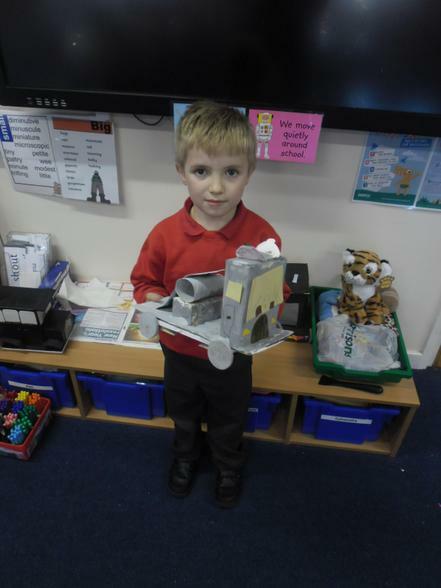 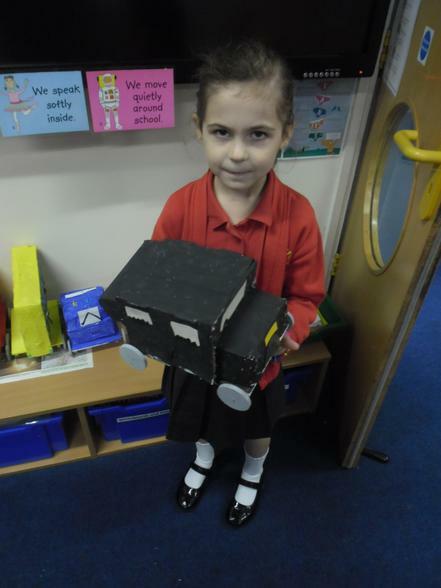 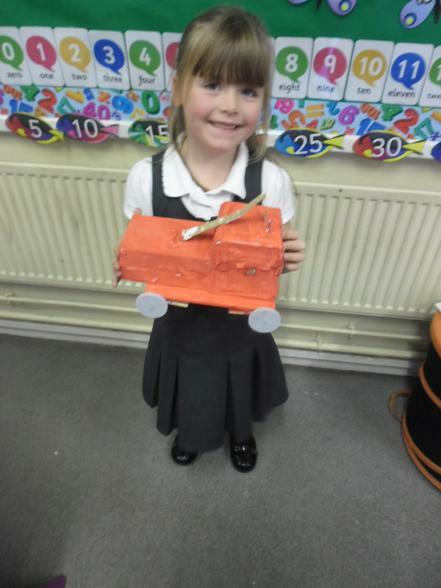 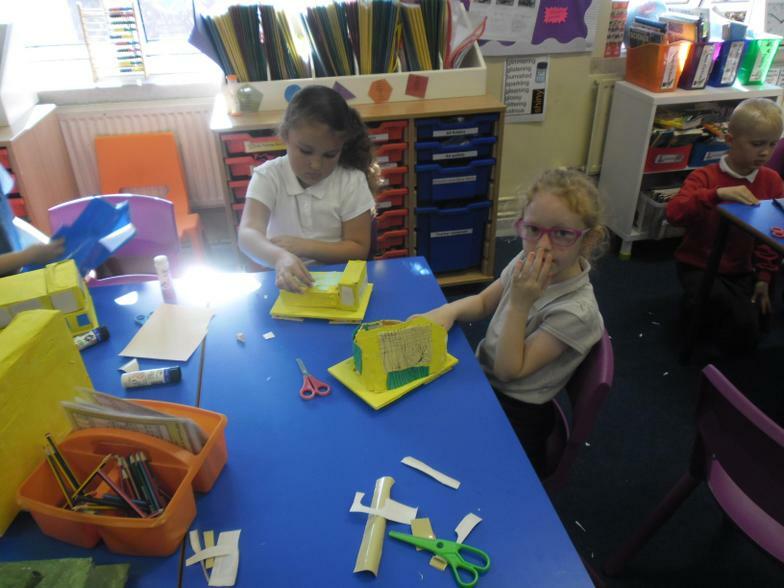 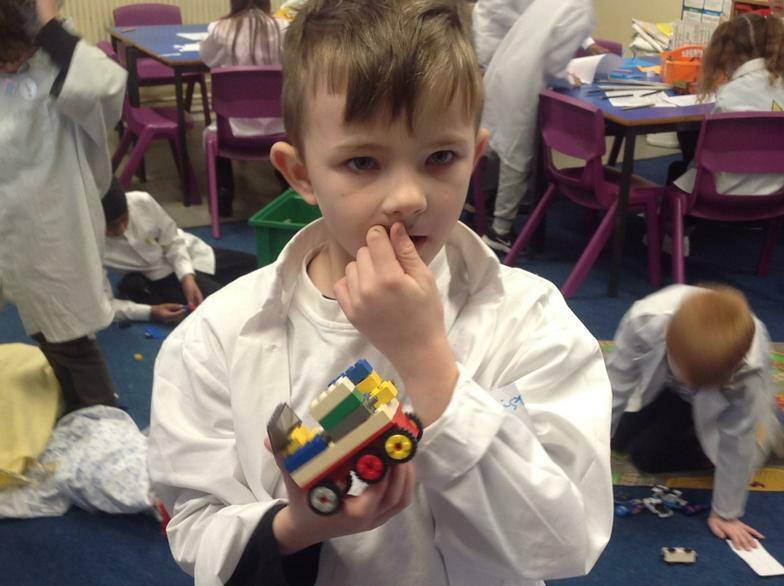 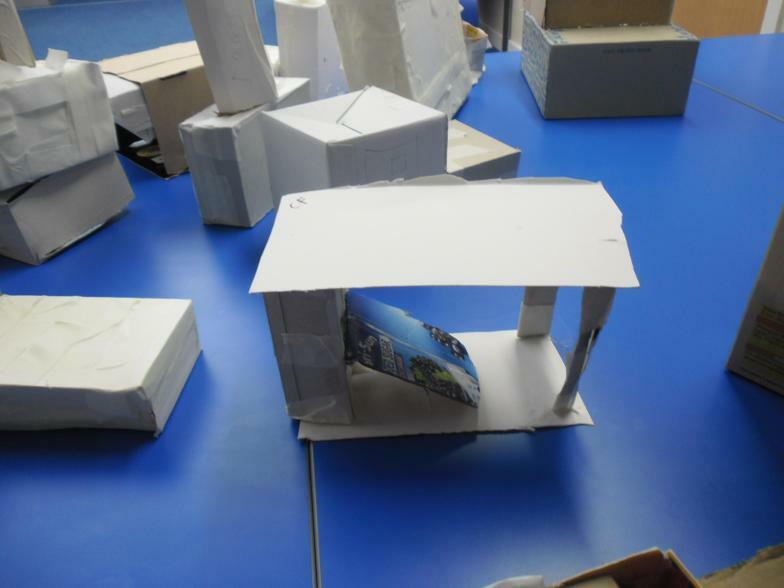 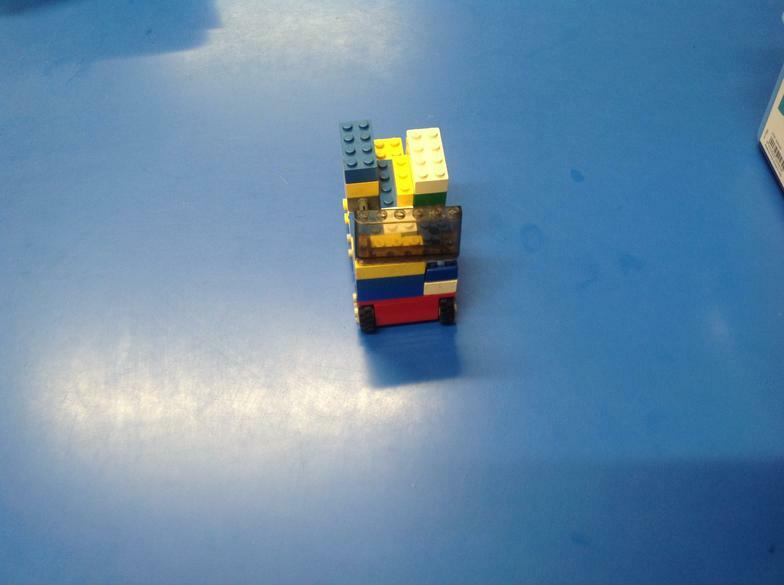 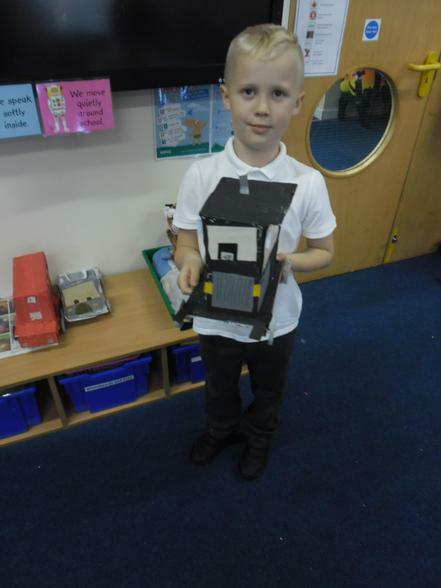 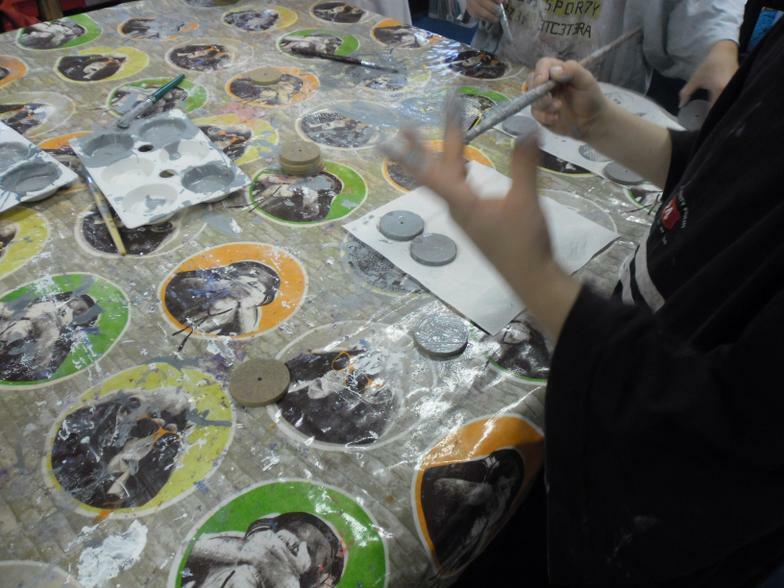 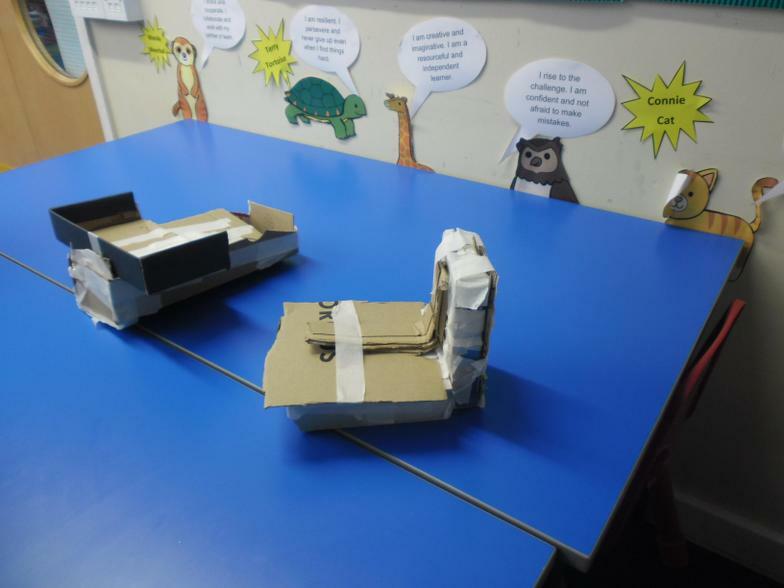 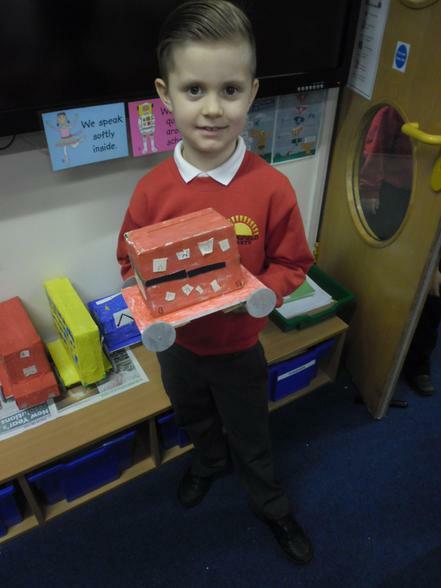 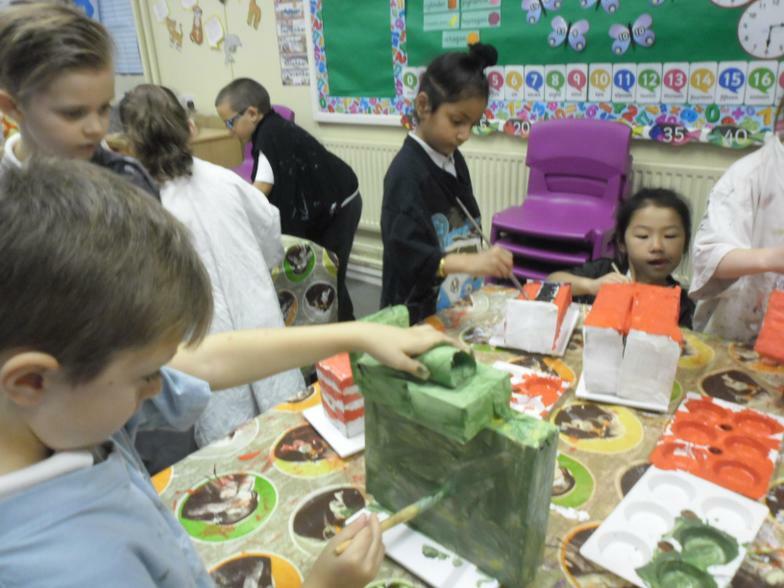 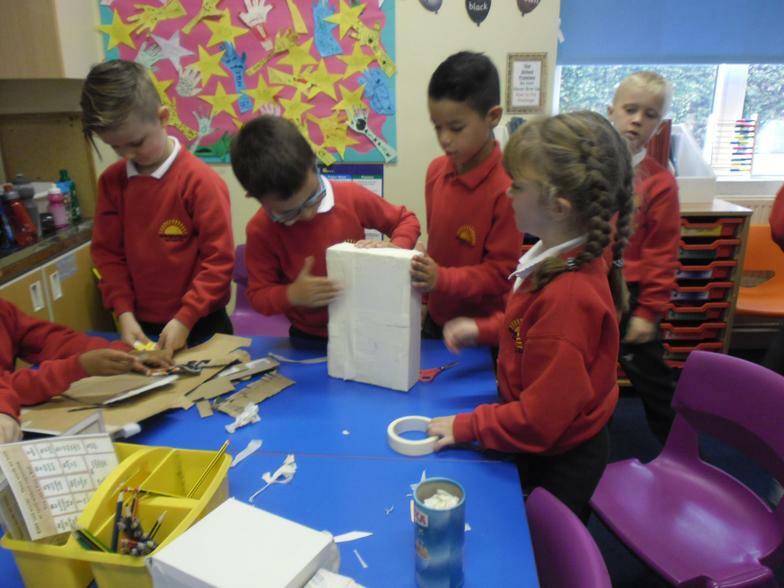 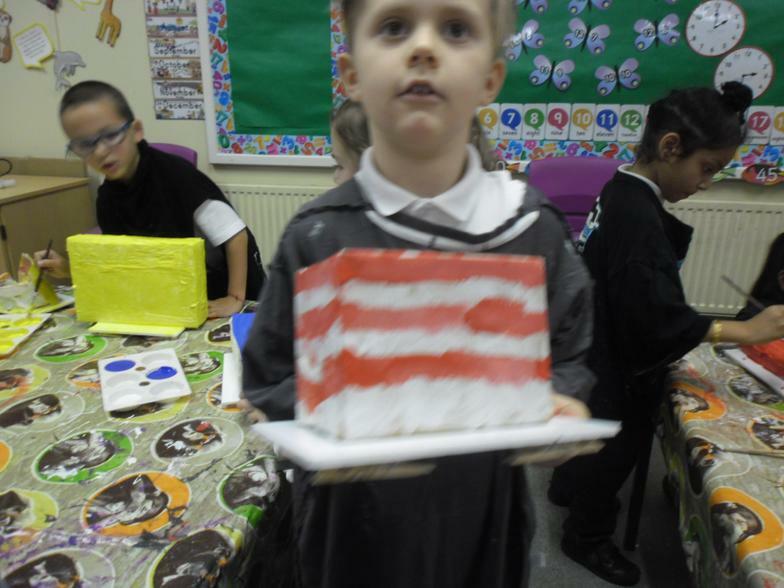 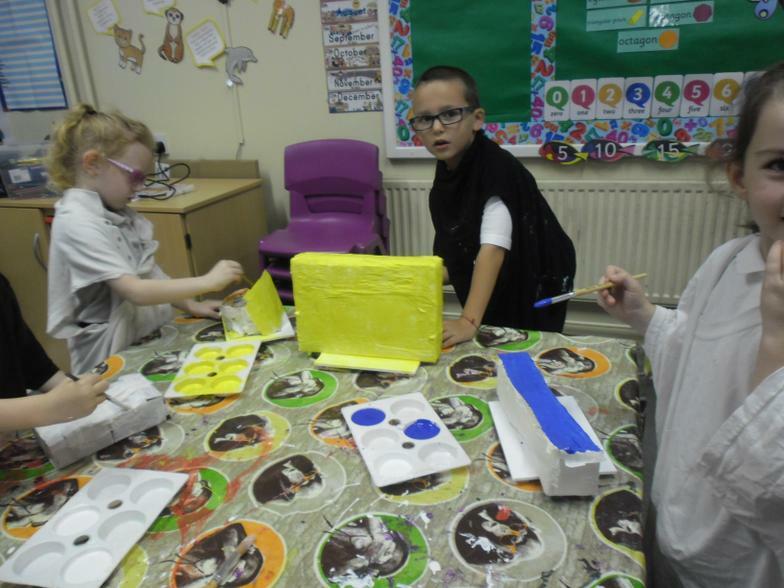 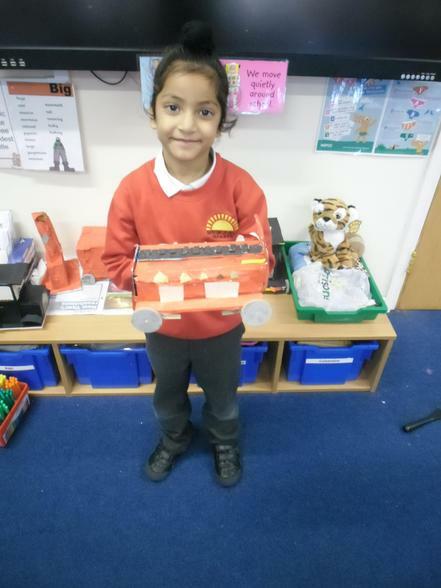 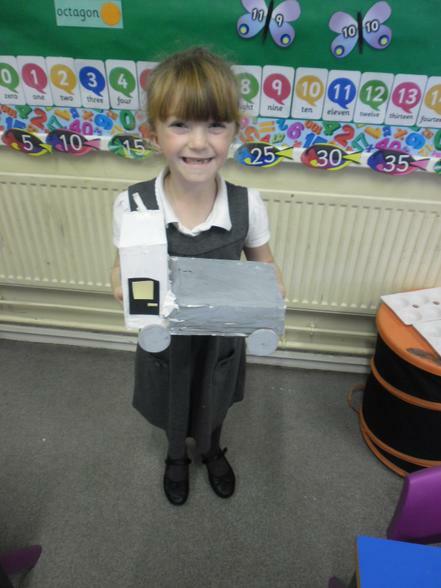 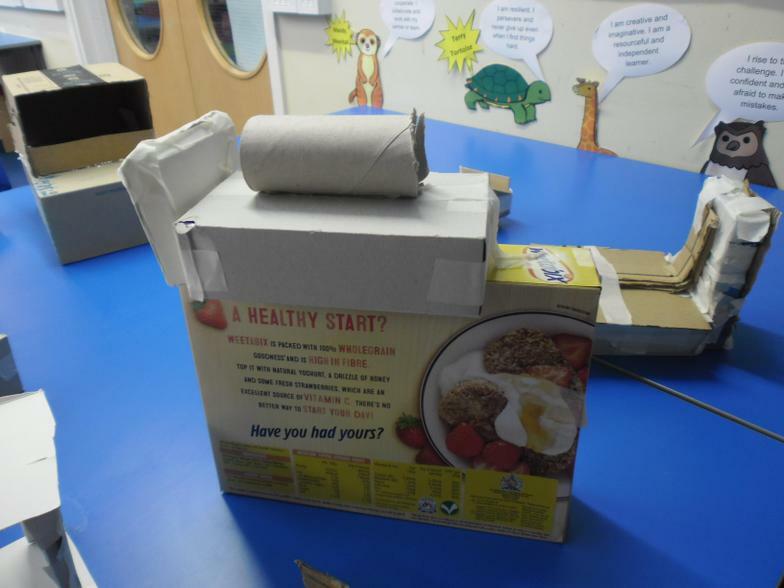 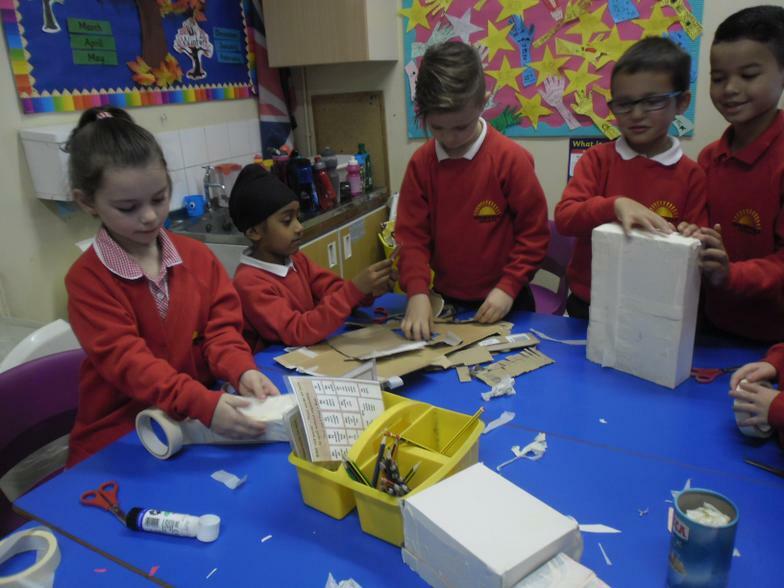 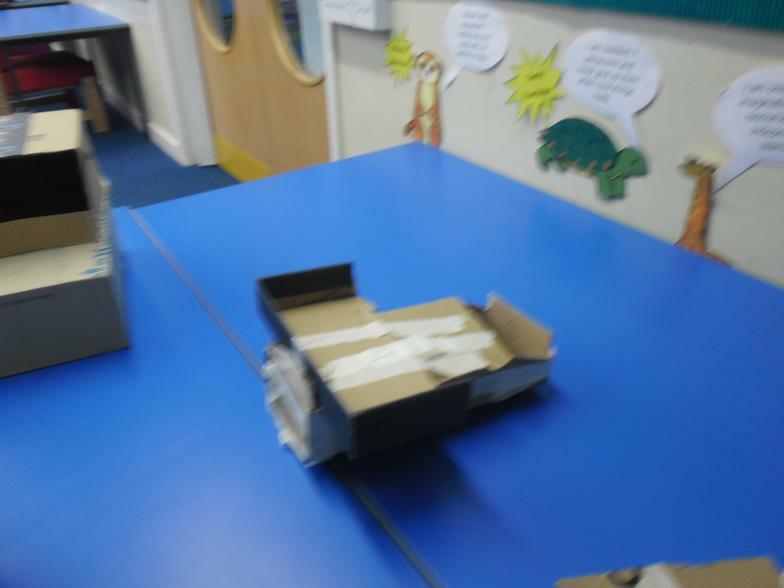 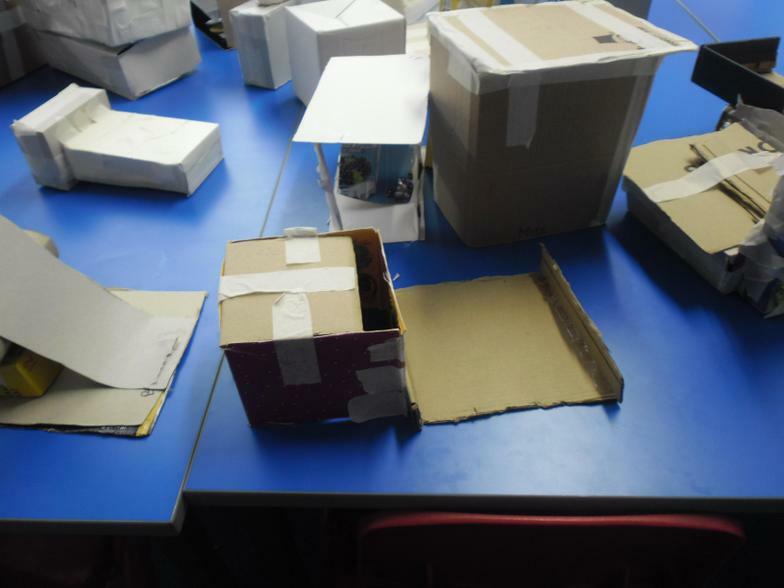 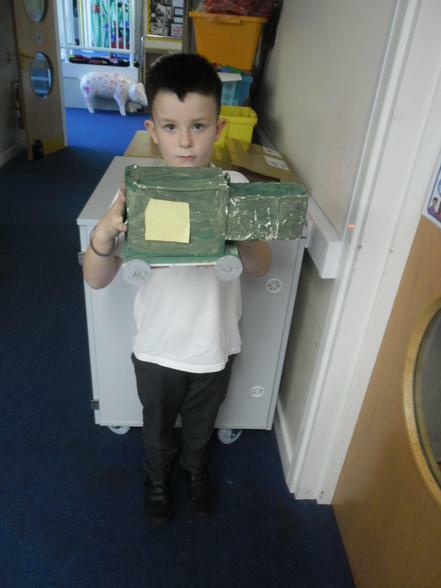 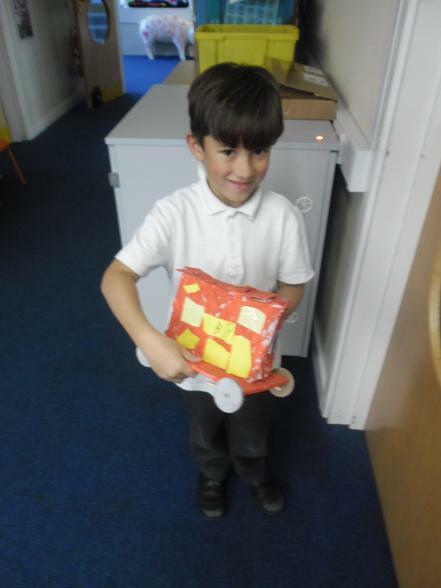 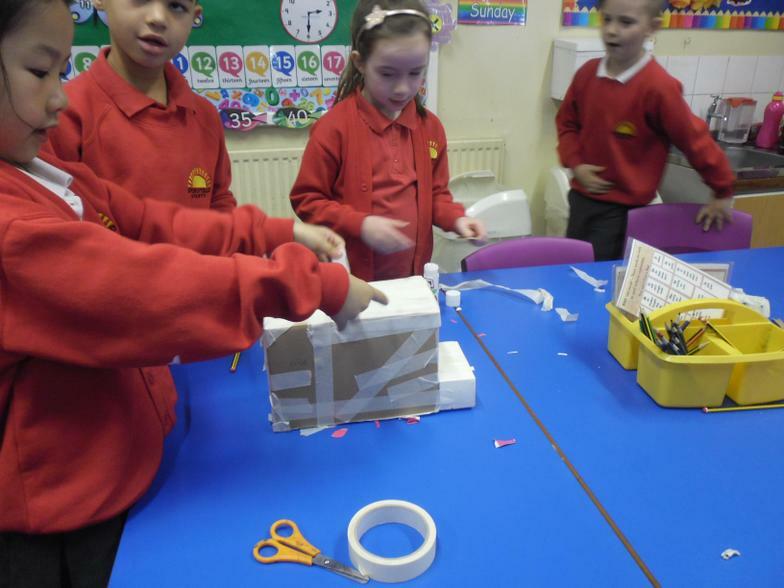 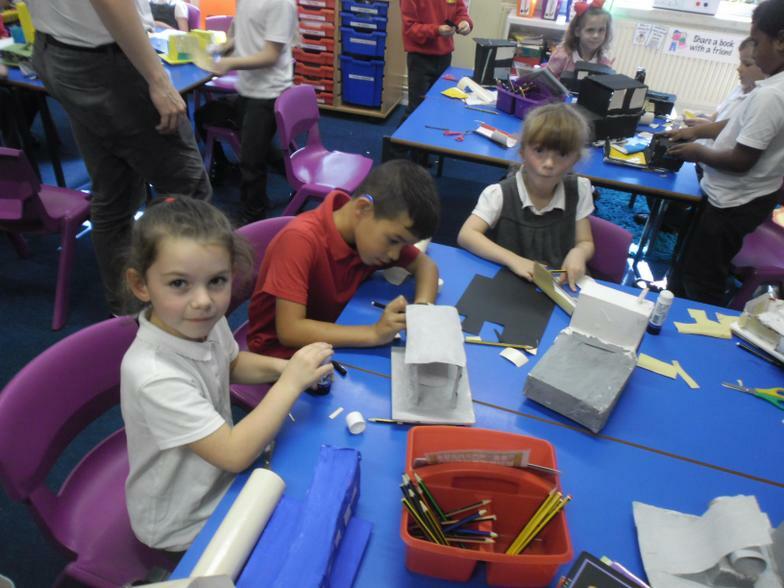 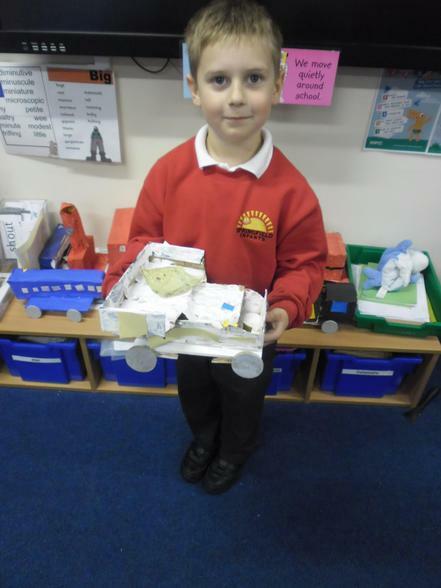 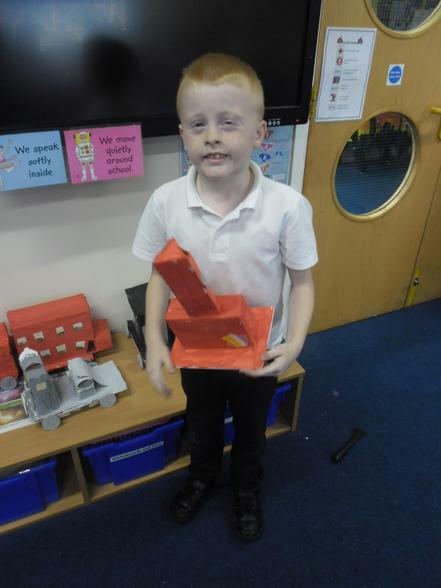 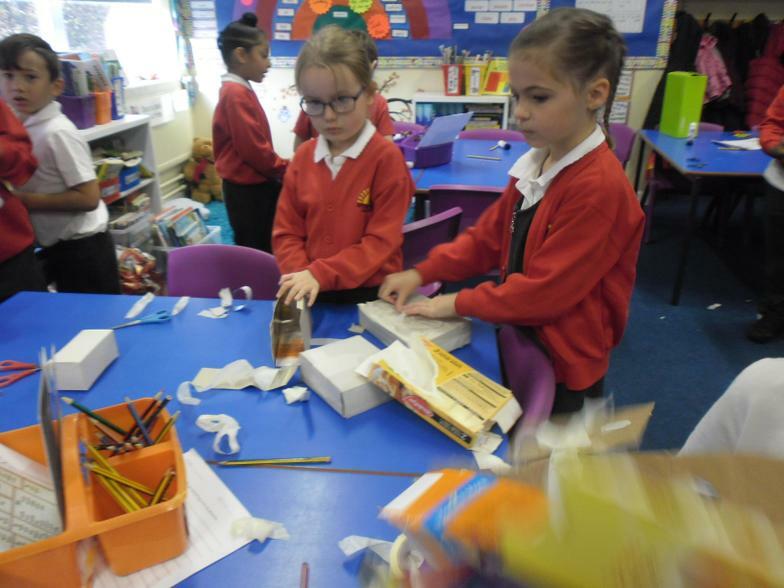 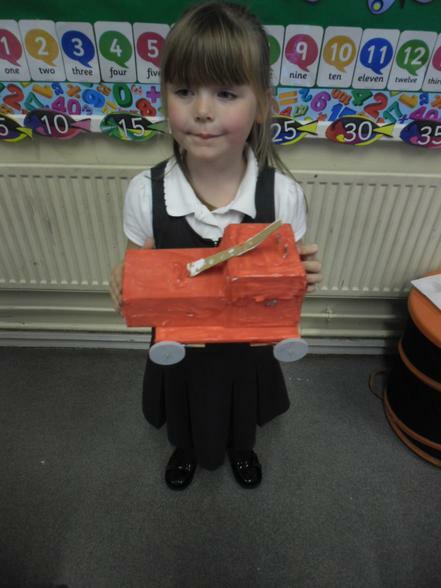 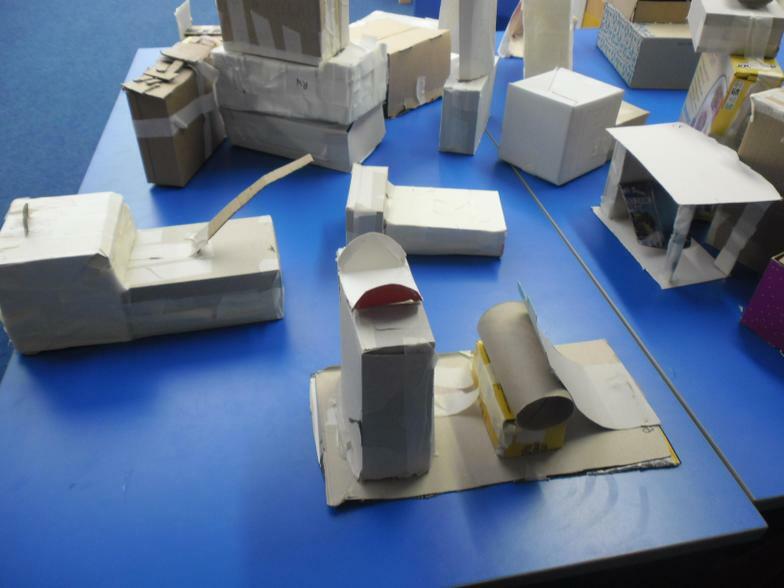 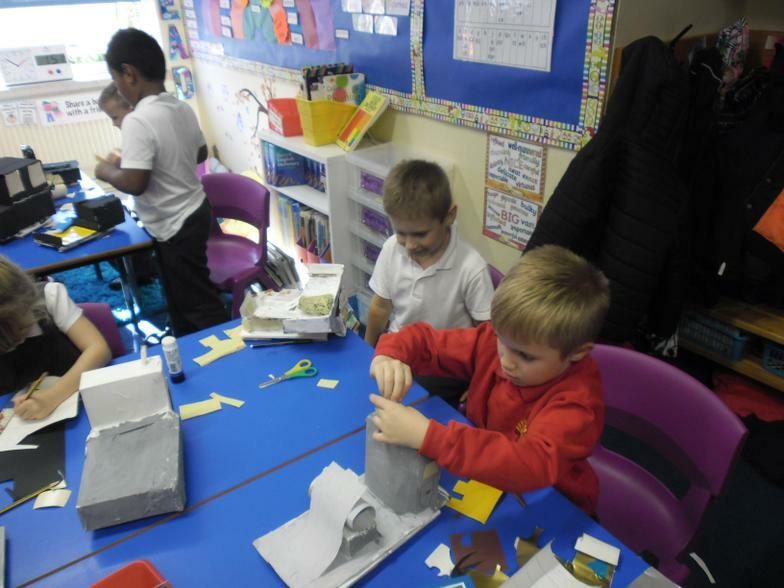 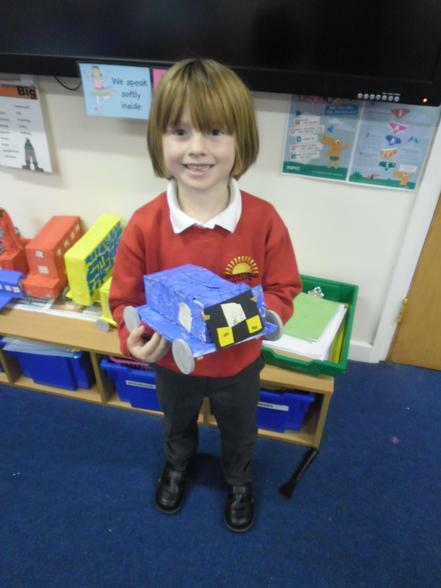 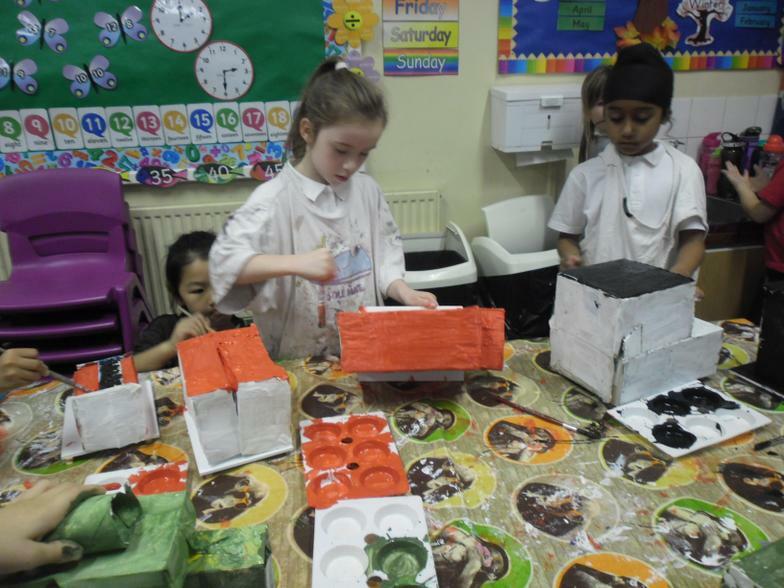 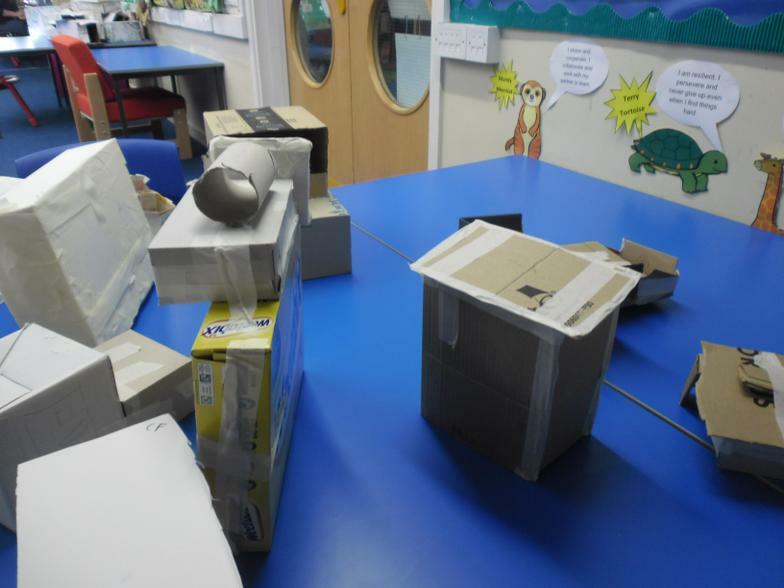 The children really took time and effort to make their models like their designs, the very last thing they did was evaluate their designs and think about what they changed or would like to add when they make models again. 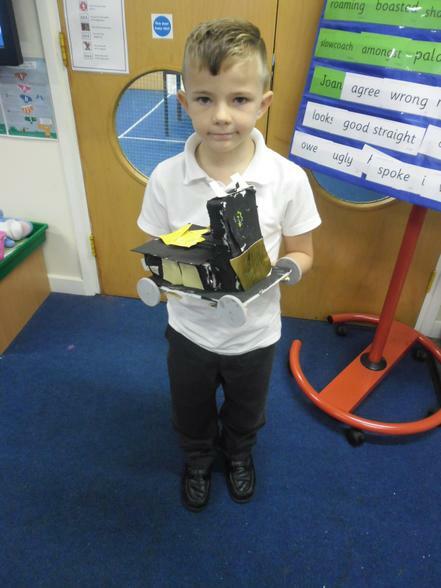 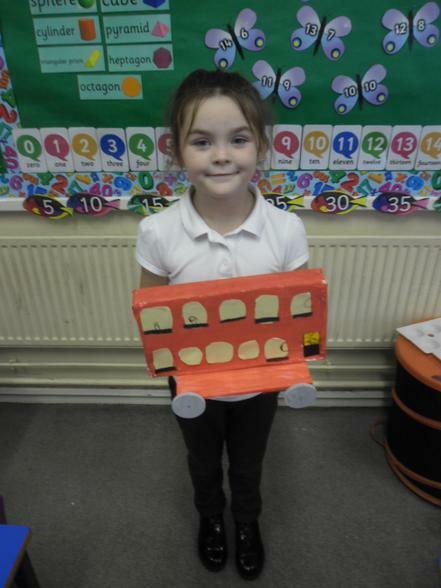 At the end we photographed each child proudly displaying their model. 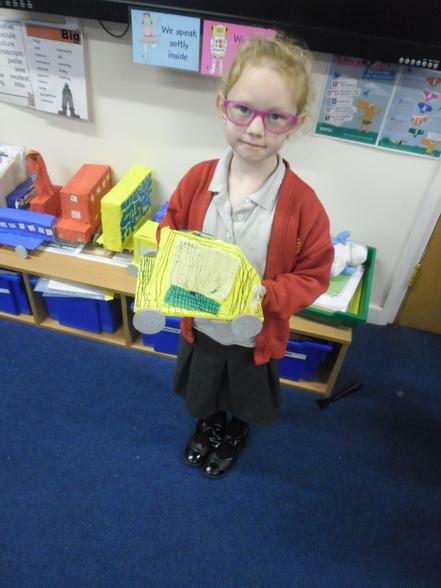 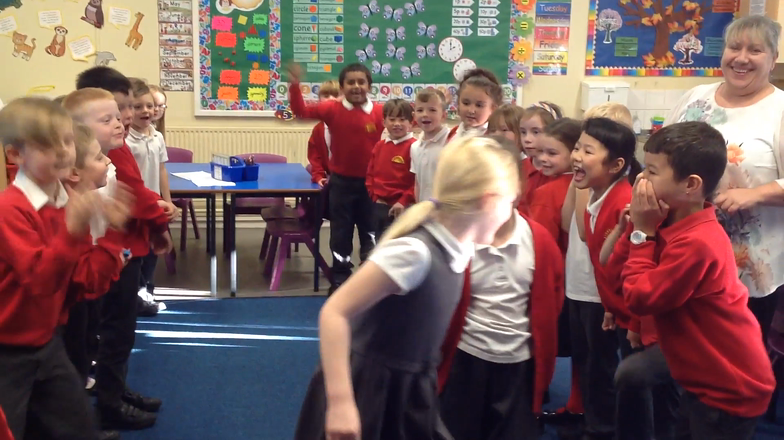 This week to begin our topic we have learnt about Guy Fawkes and Goldilocks. 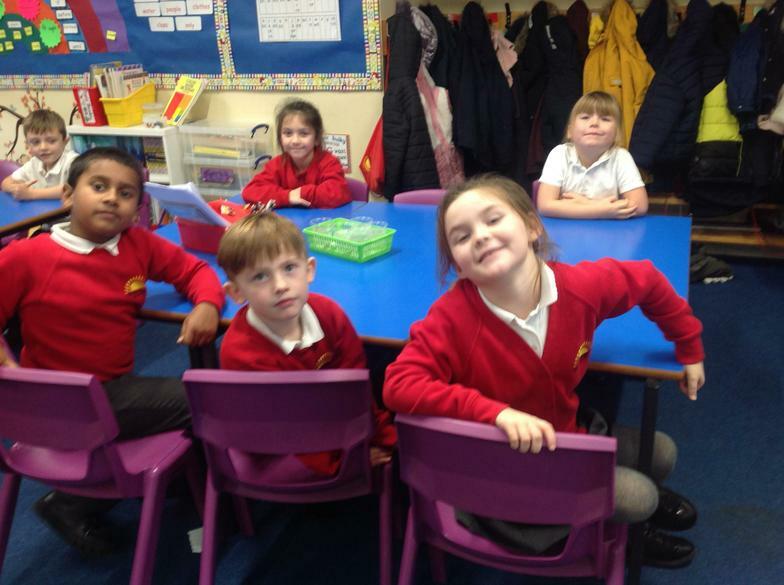 We spent an afternoon this week working on our oracy skills, identifying the story first by clues, then retelling it chronologically, before thinking about it in a different way and discussing what we thought she should do. 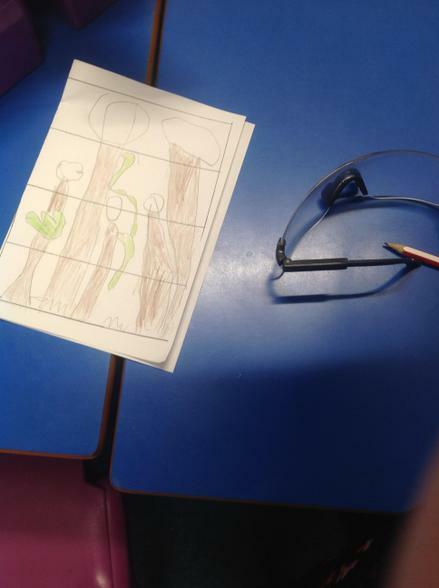 We imagined she was a little girl of 3 or 4 and decided she had got lost from her parents, she had been alone in the wood and there were some very dangerous animals around, what should she do? 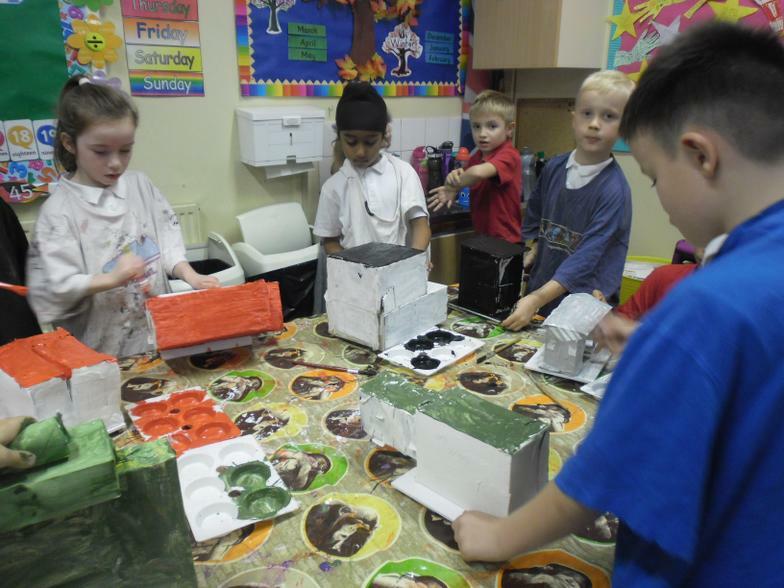 Stay in the wood or go in the house with the bears? 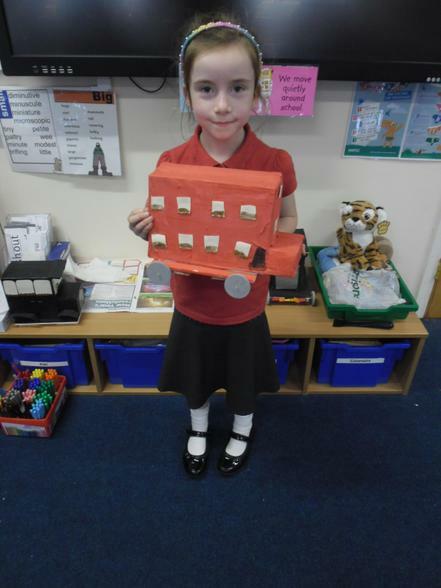 Goldilocks, should she go in the house or stay in the woods? 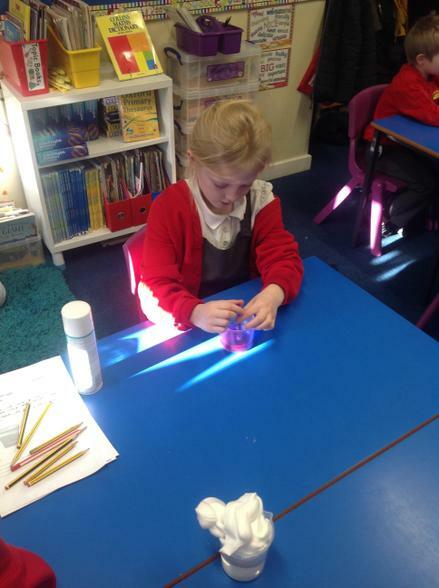 This week learnt about why we wear poppies and Remembrance Day. 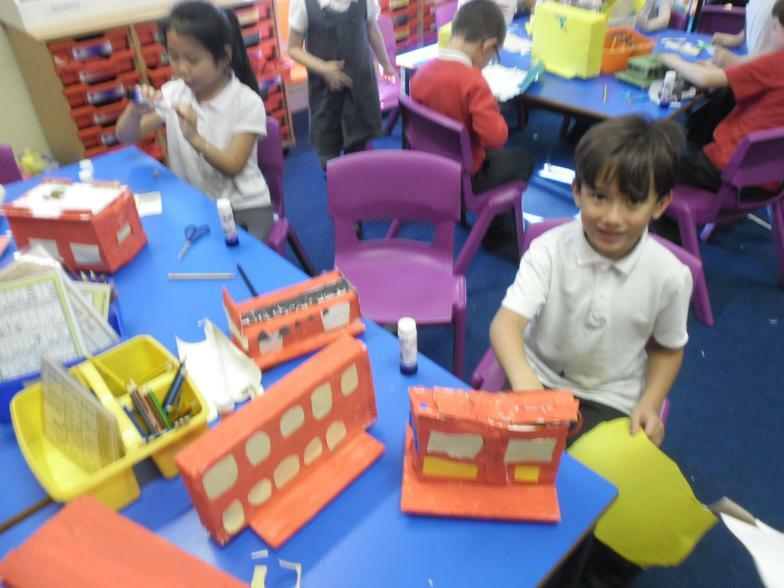 We had already made poppies for the Co-op on Norwich Road, but now we understand what they represent and why they are sold each year. 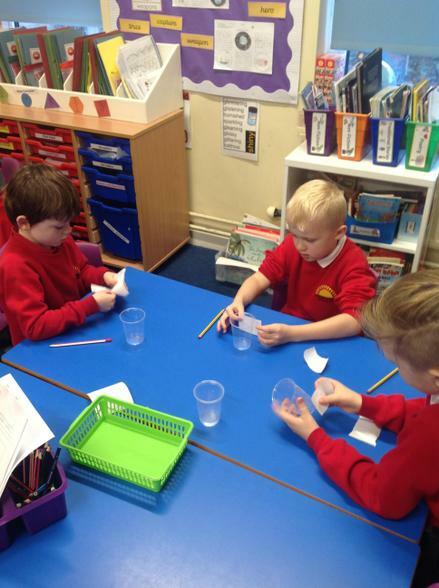 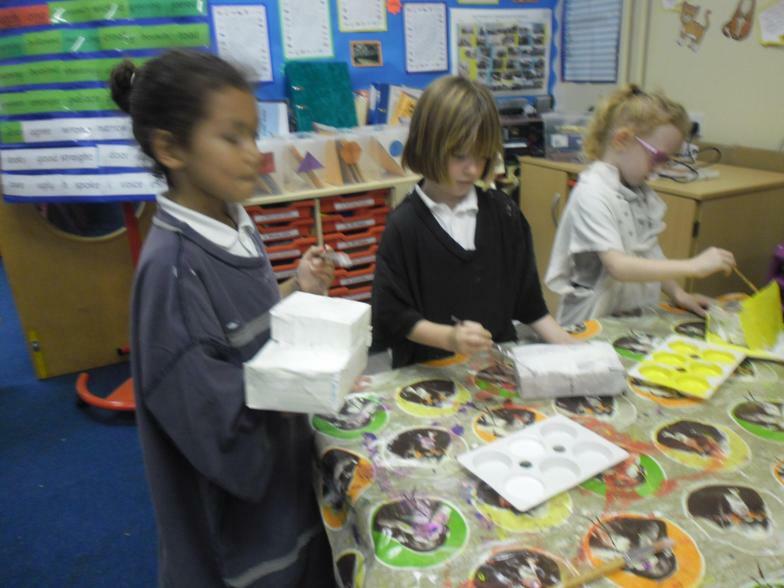 We also made body skeletons in Science which was great fun. 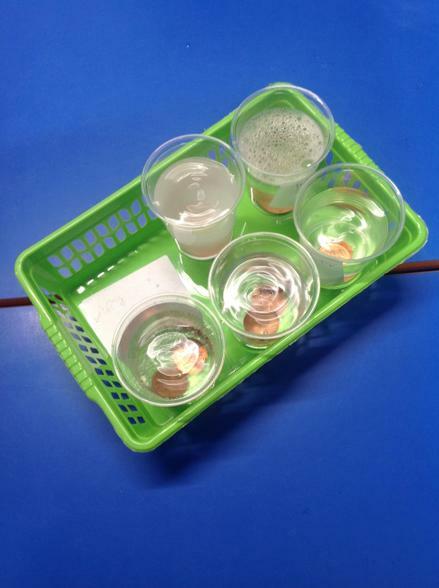 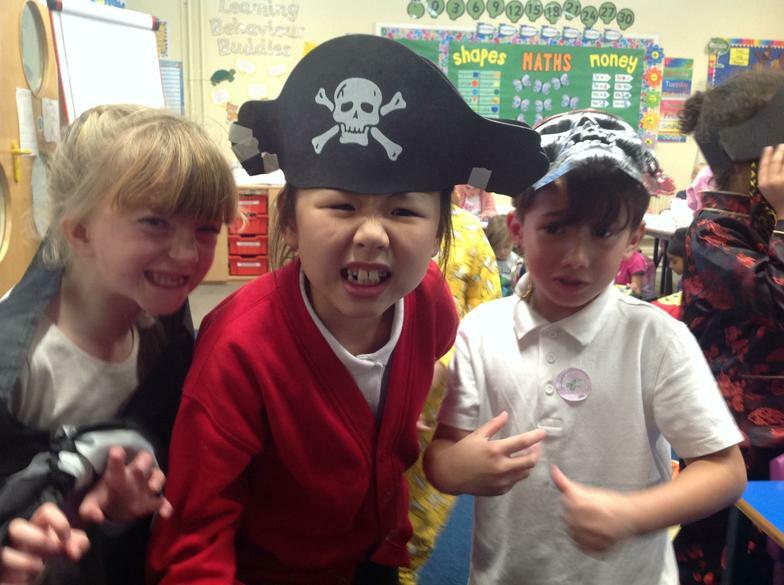 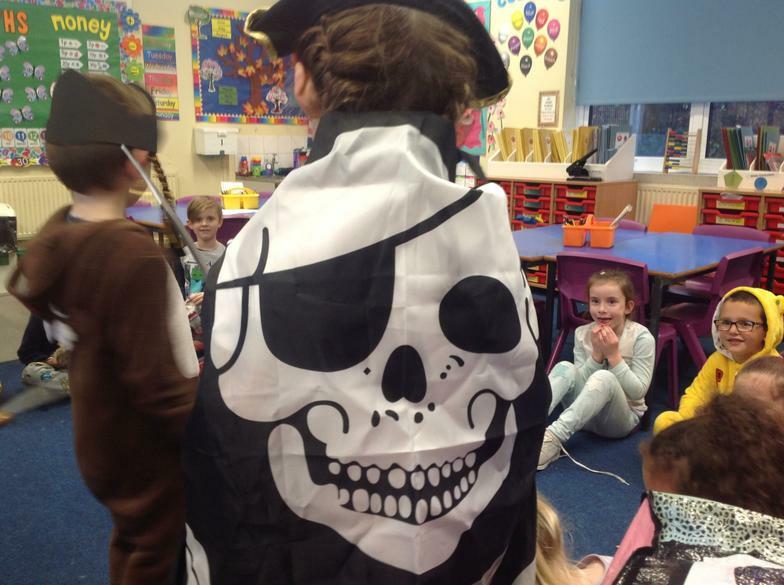 We have completed a science investigation this week after receiving a message in a bottle from Blackbeard, he asked us to find out how to clean his dirty doubloons. 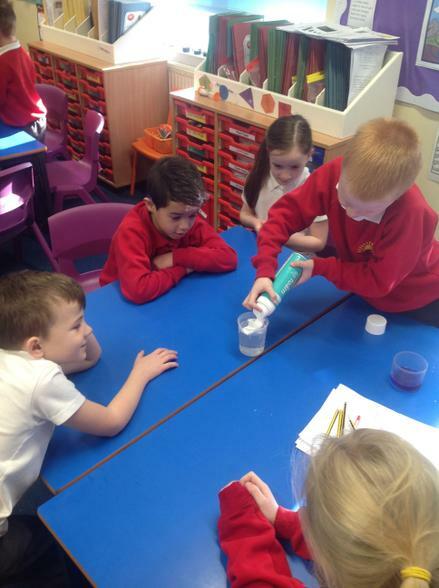 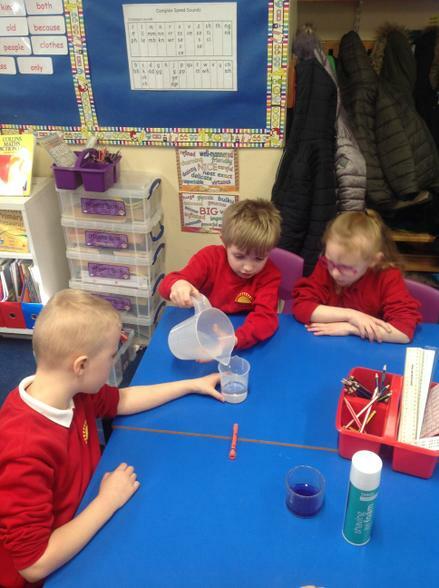 We tried some different liquids to see what cleaned best. 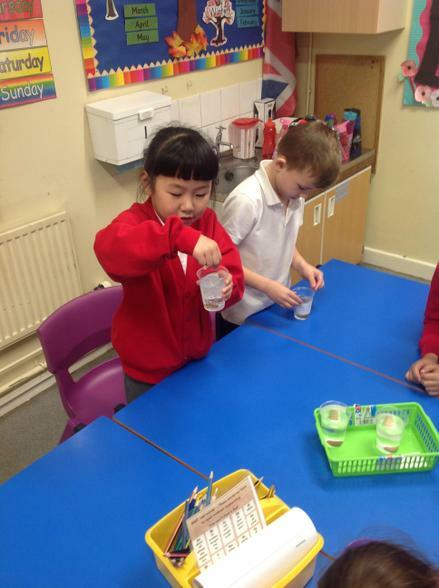 The results showed that white distilled vinegar and lemonade were the best cleaning solutions to use. 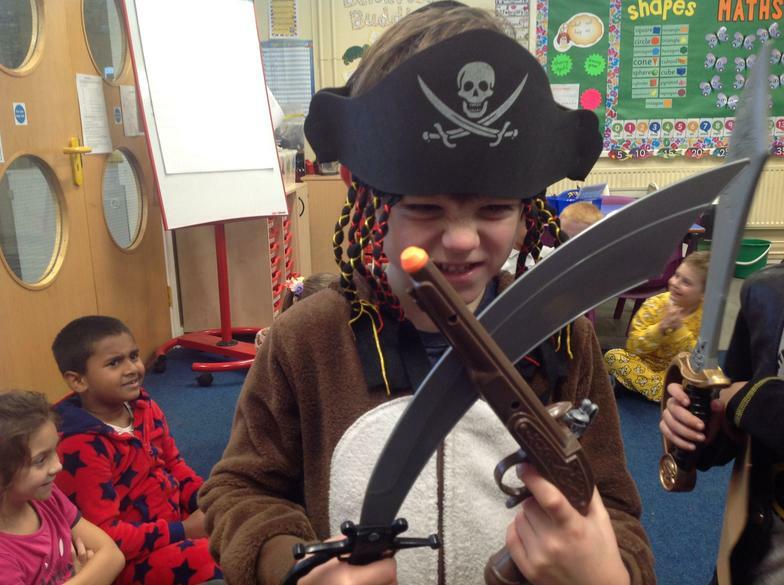 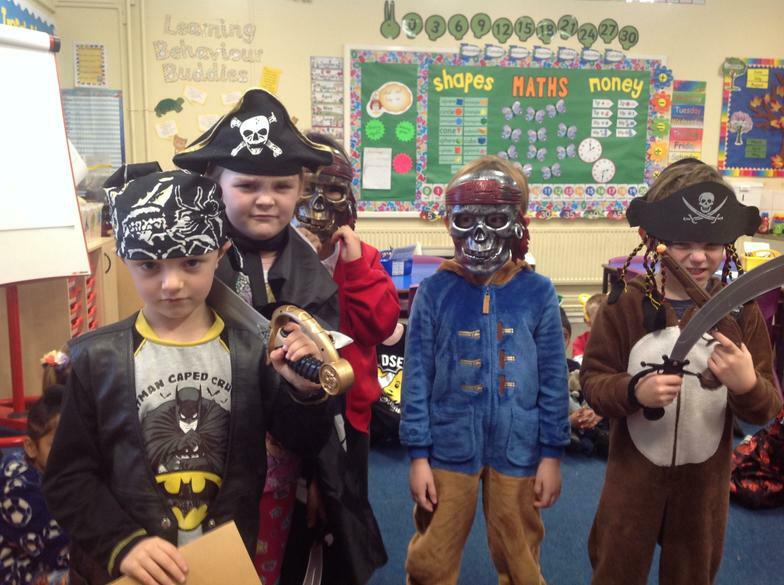 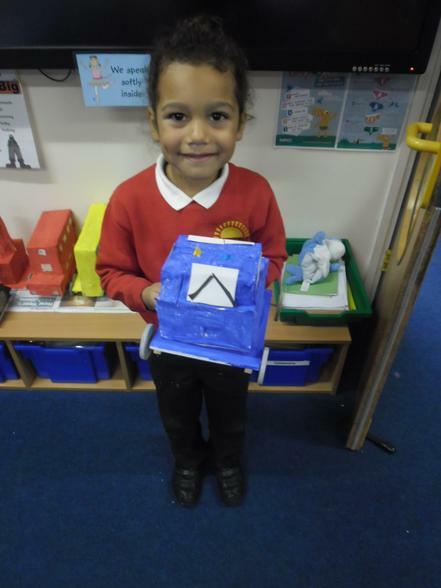 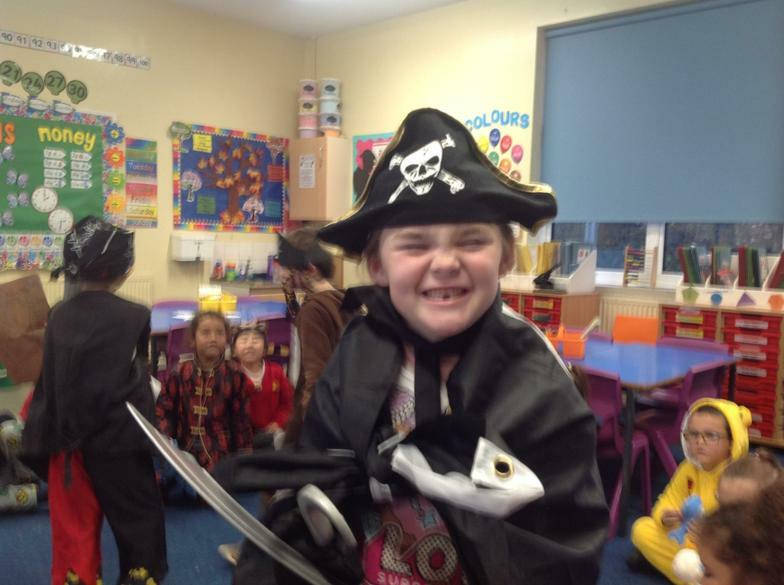 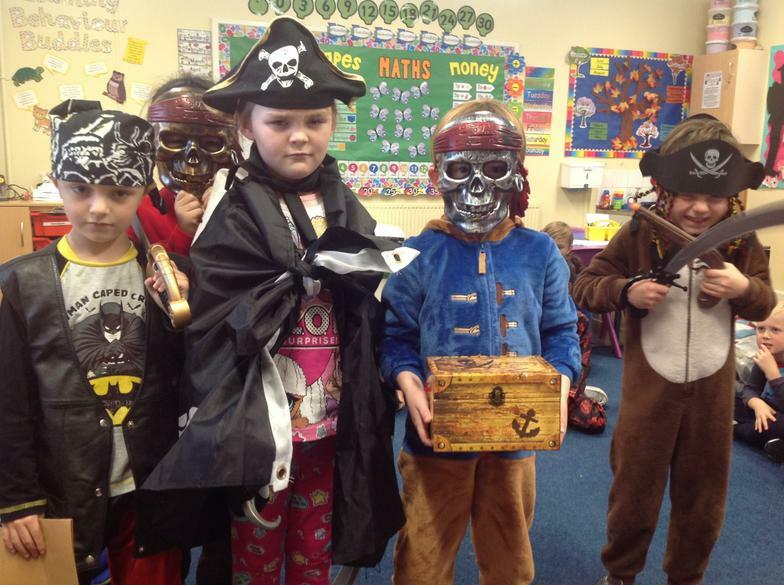 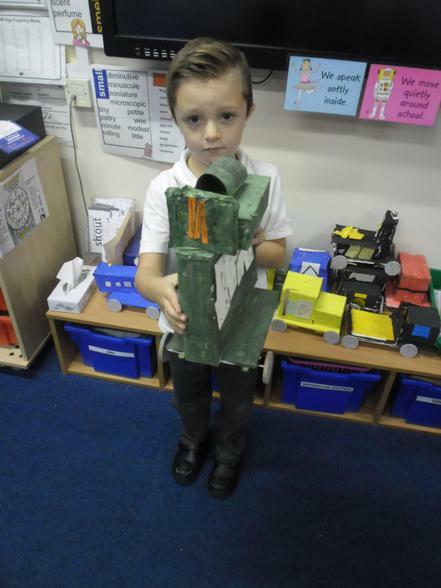 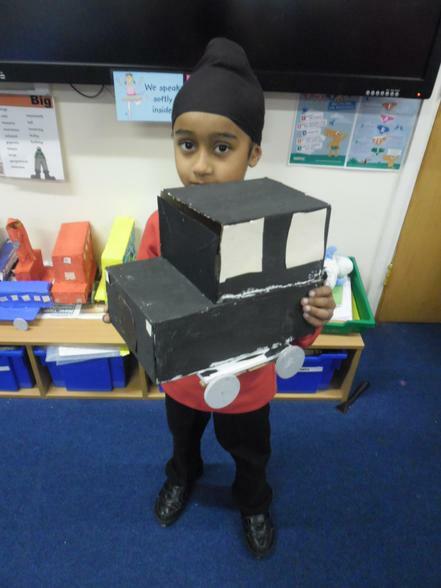 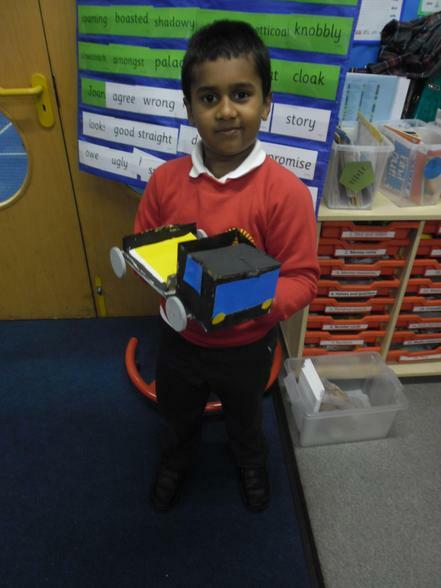 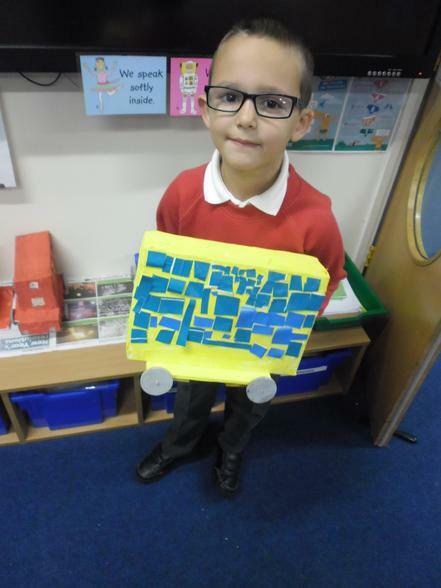 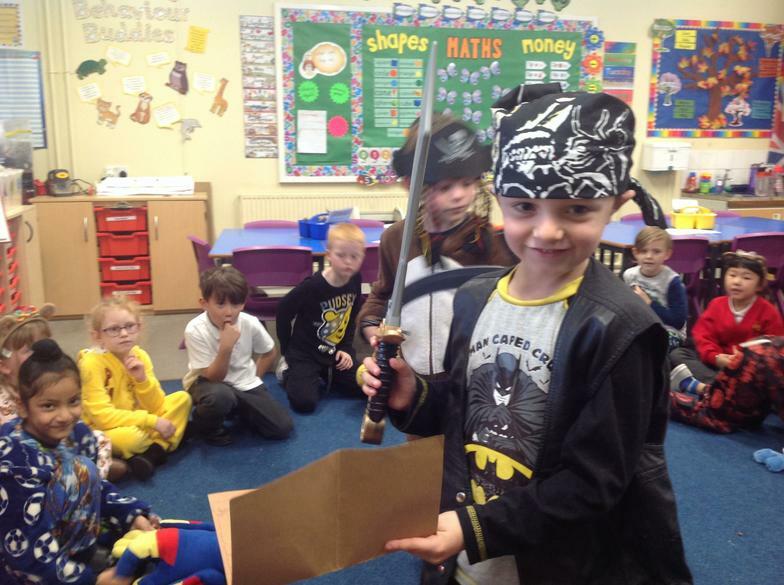 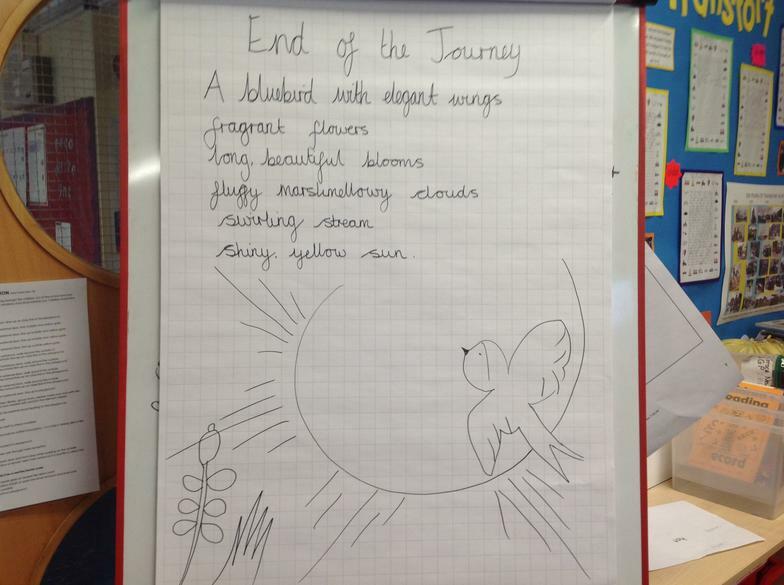 In golden time we have been pirates and in Literacy this week we have been writing poetry based on the story we have been reading called the Robot and the Bluebird. 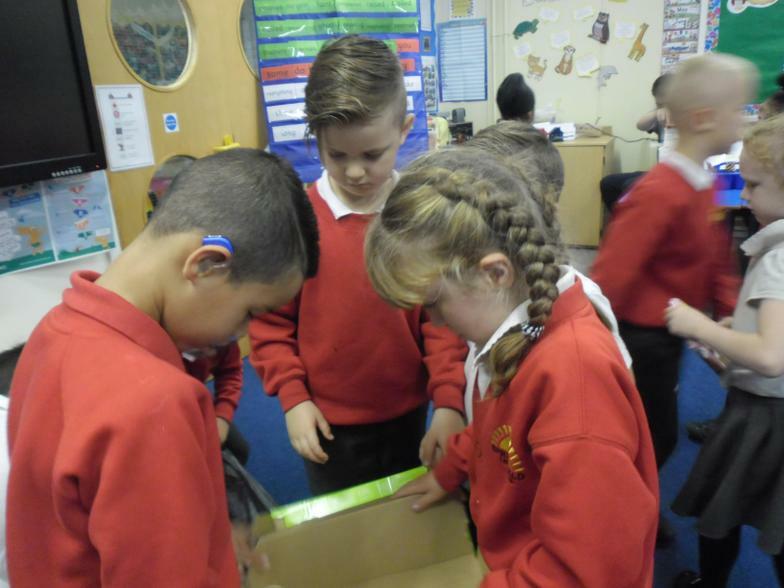 A huge thank you to all of those that purchased raffle tickets for the Christmas hampers, the money raised will be used to help buy new books for the library and fund some playground equipment for use at lunchtimes. 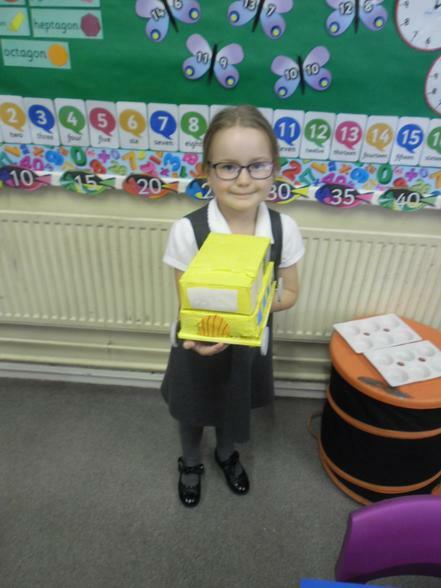 The proud raffle winner for 2BP was Rylee, all the children received a chocolate lolly as a consolation prize. 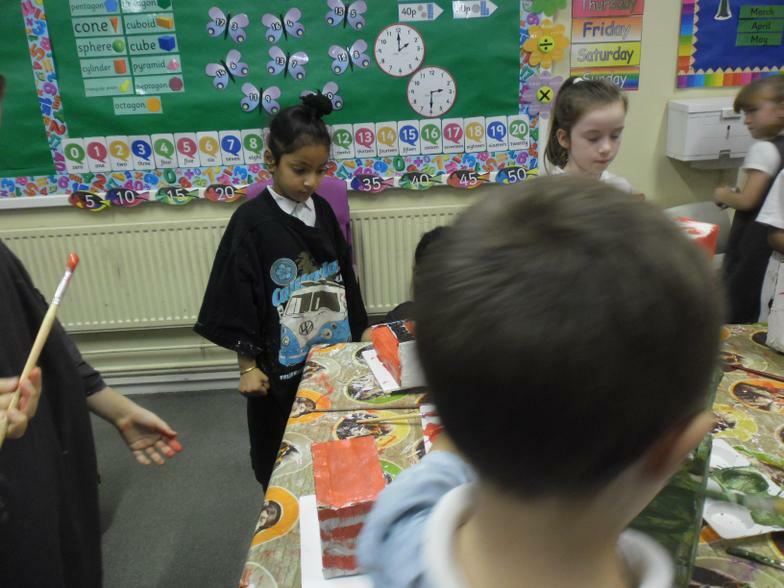 Christmas Jumpers, Raffle Winner and Chocolate Lollies.